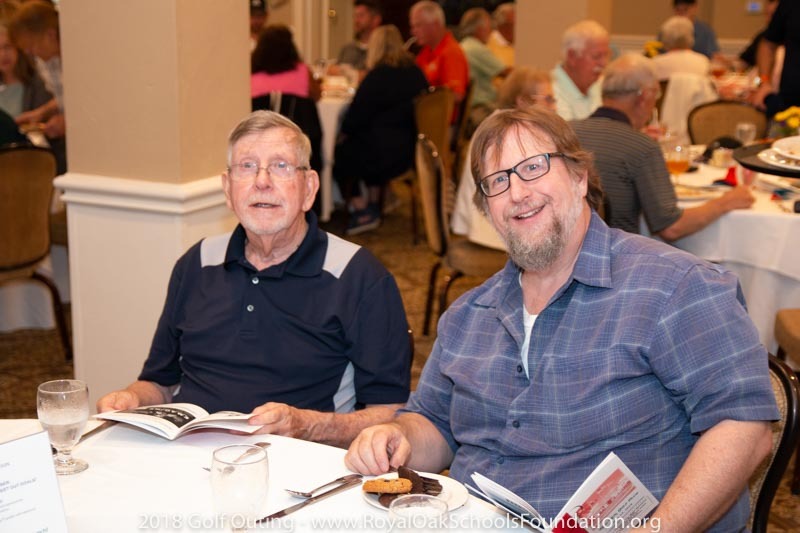 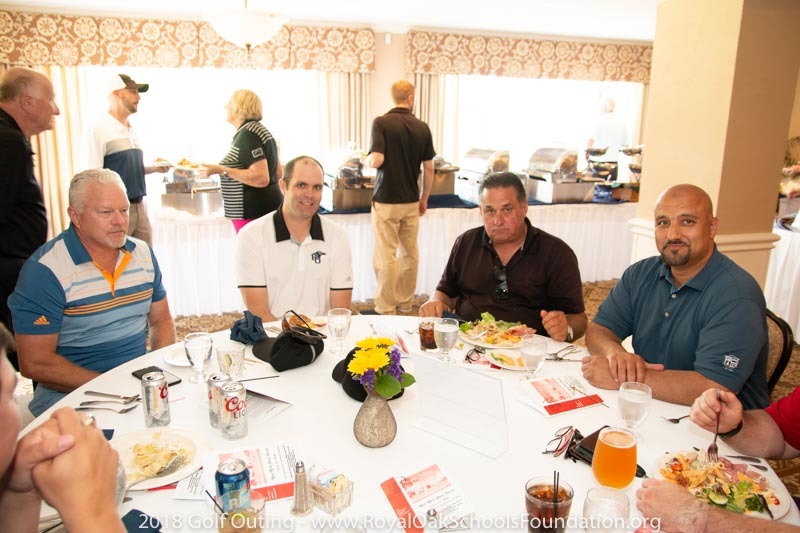 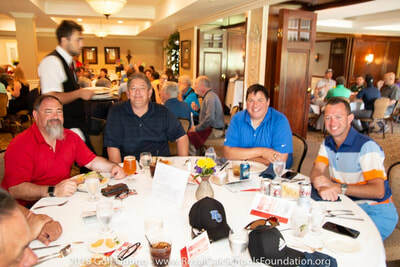 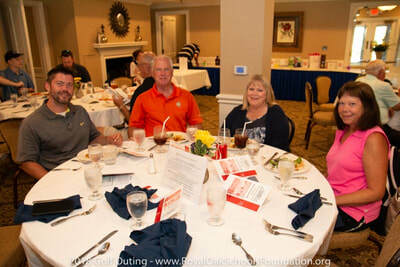 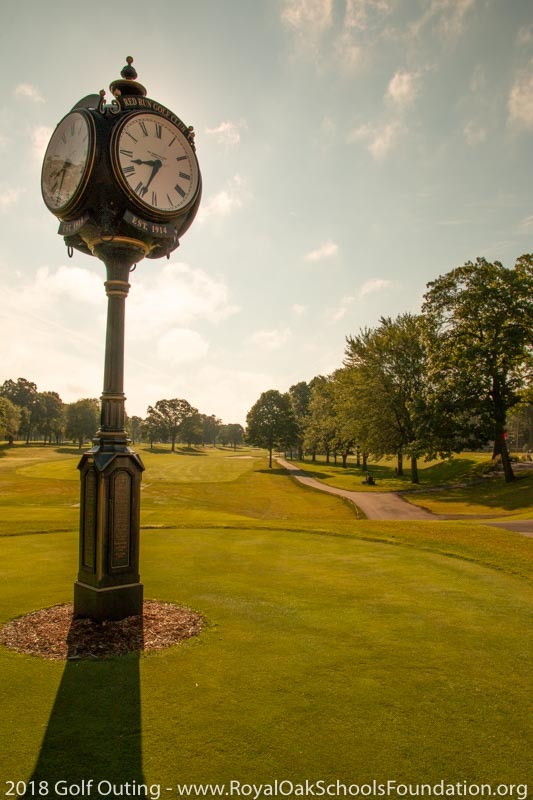 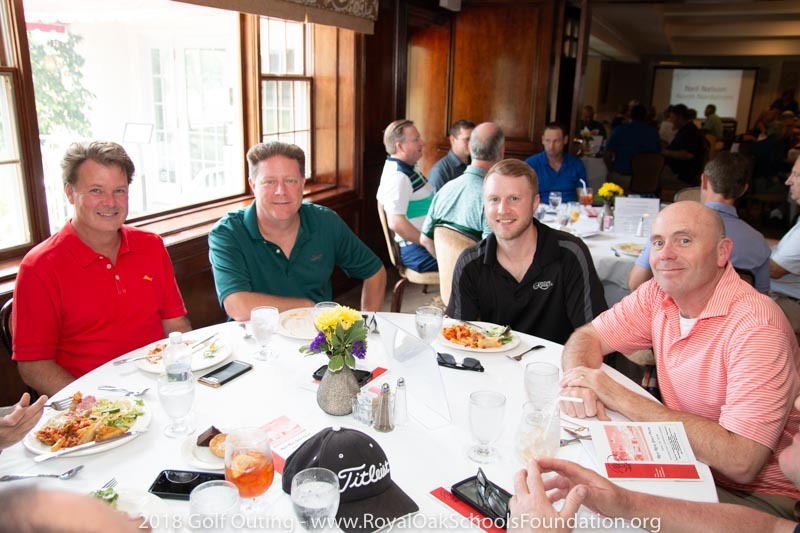 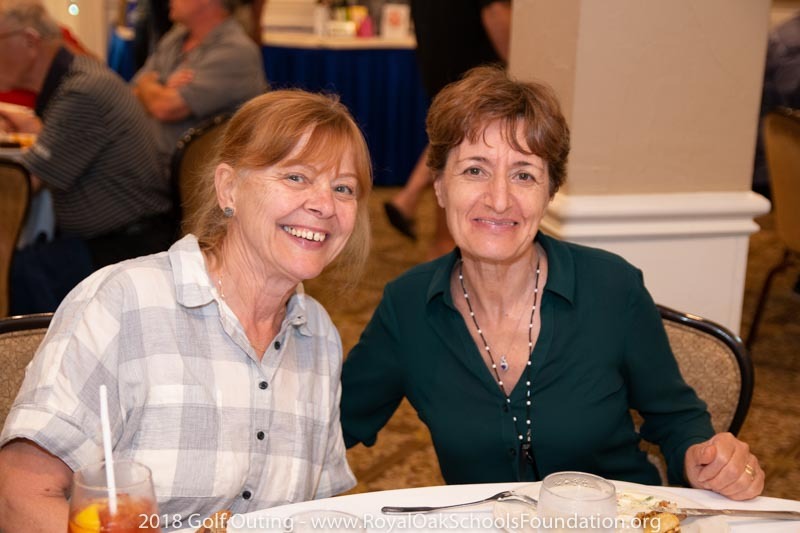 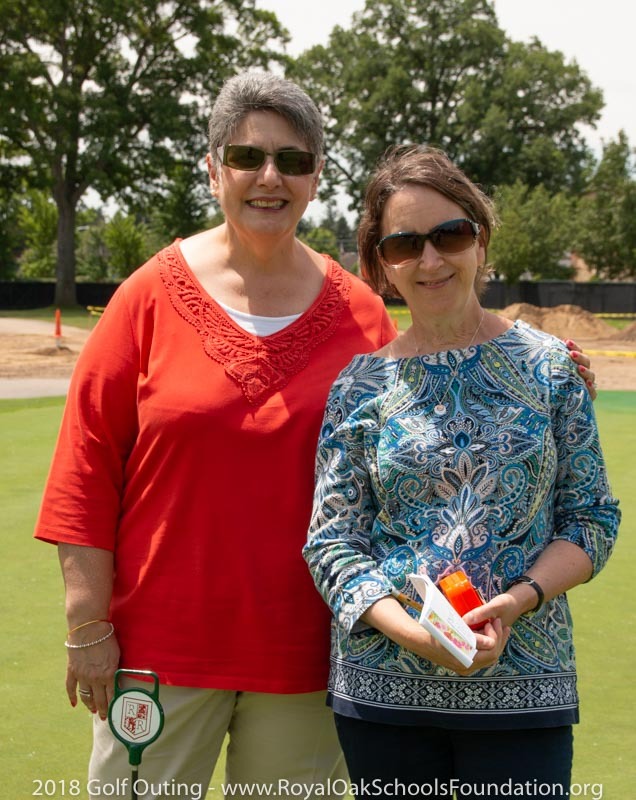 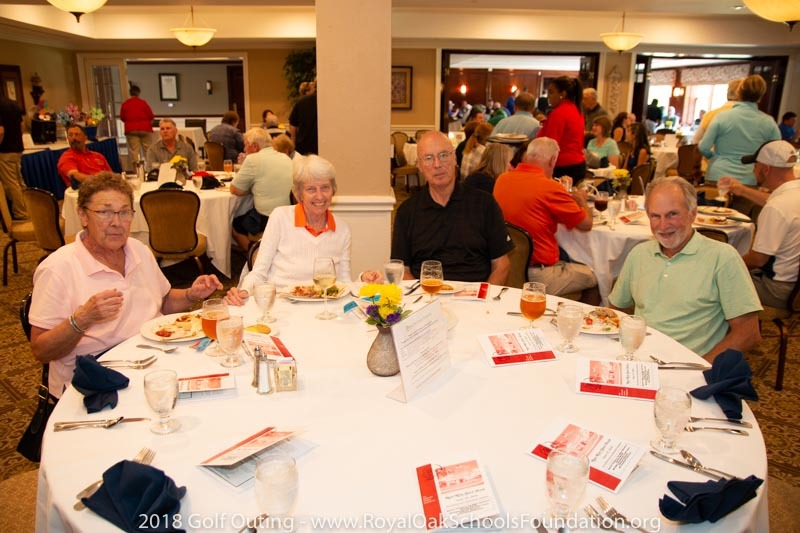 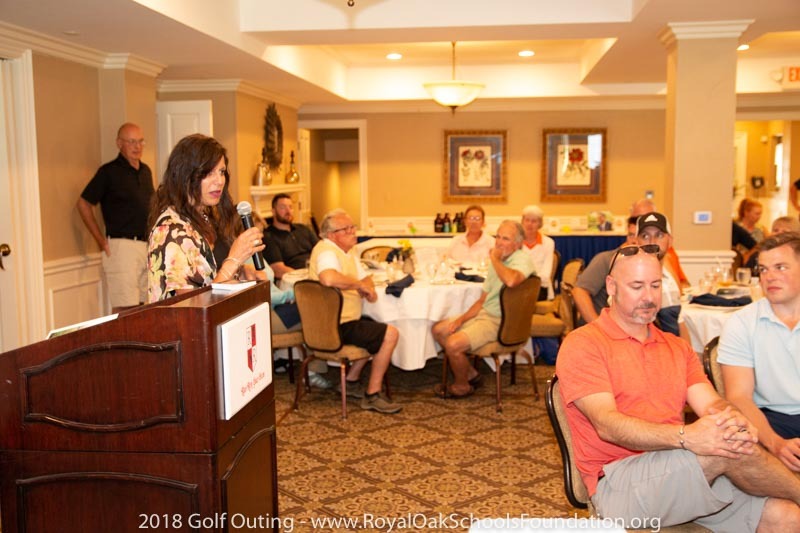 25th ​ROSF Red Run Golf Outing is History! 129 Golfers were even more than last year! 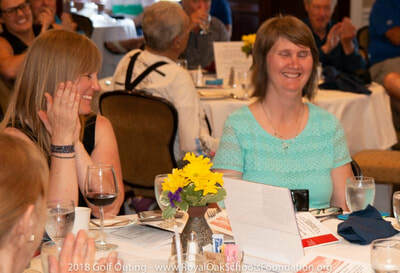 It looks like we’ve beaten Last Year's Record! 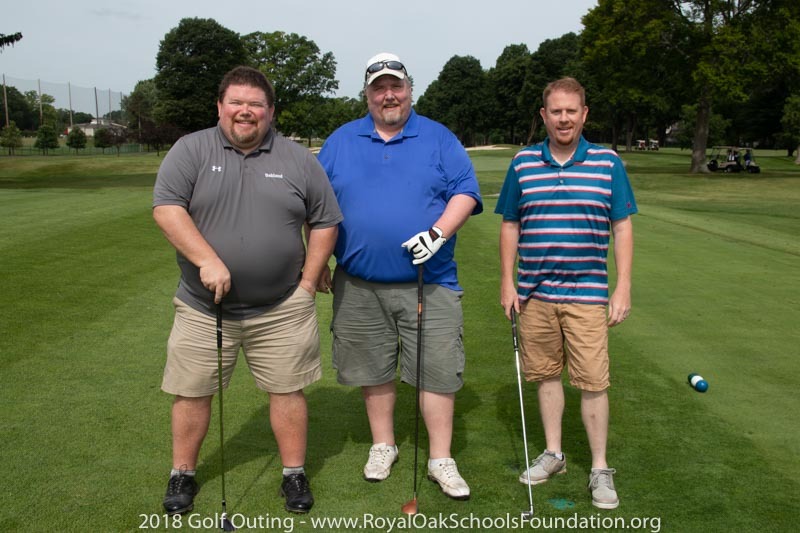 The 2018 Golf Outing maybe the one for the books... until next year! 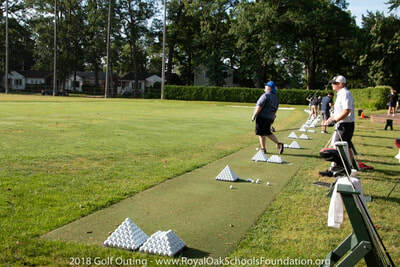 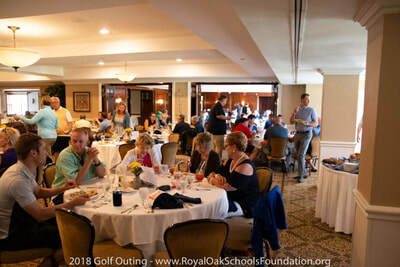 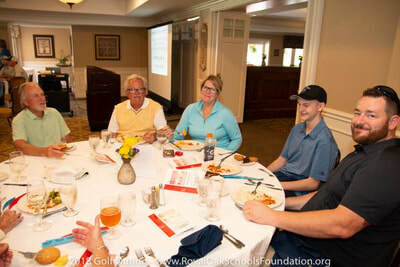 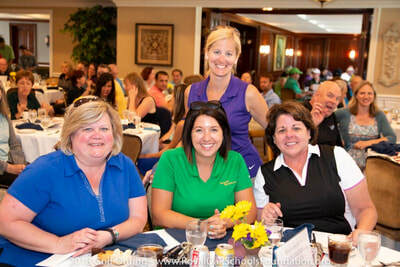 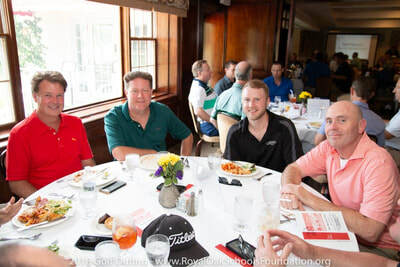 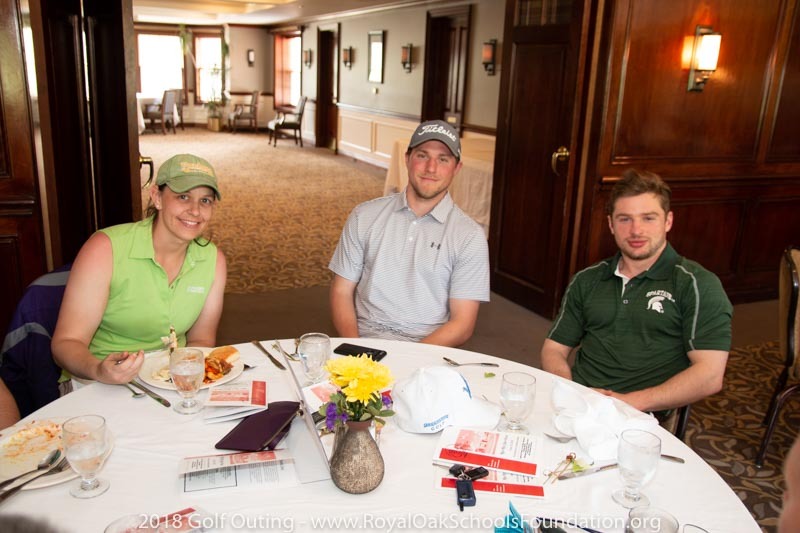 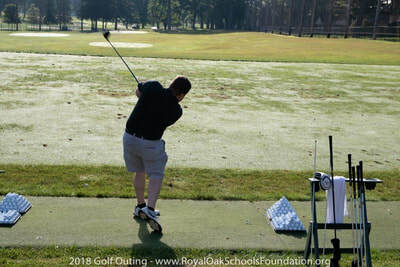 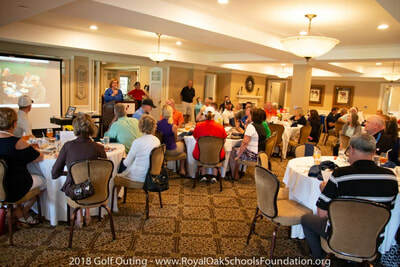 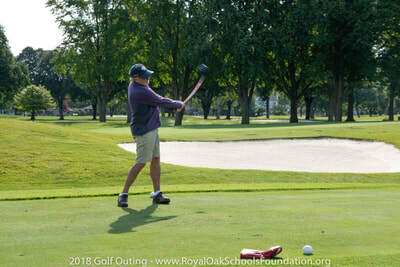 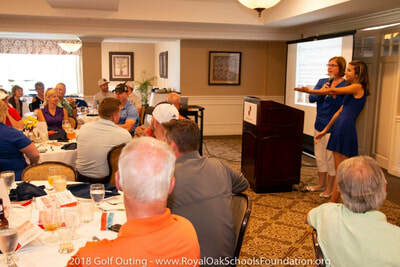 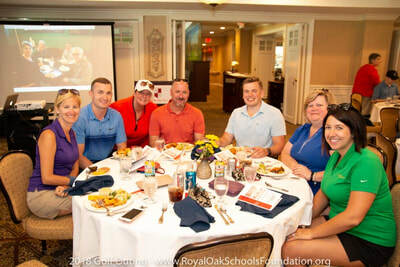 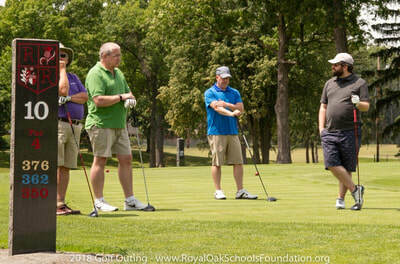 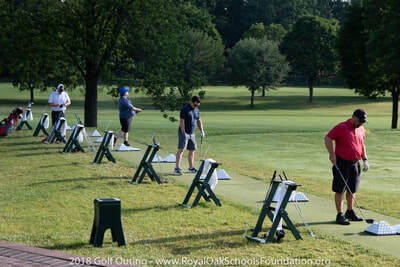 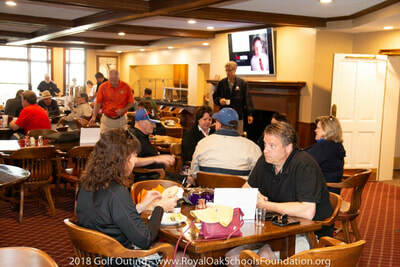 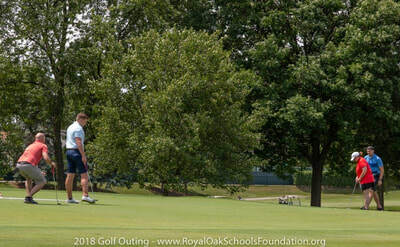 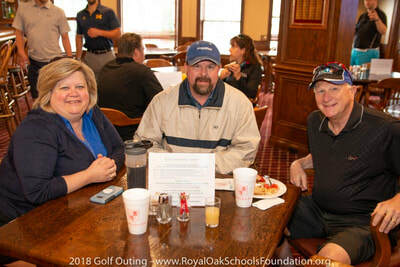 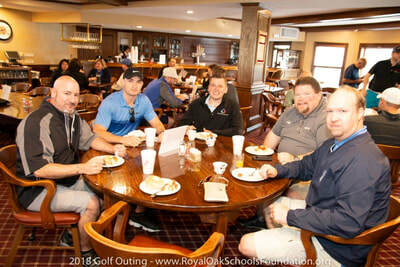 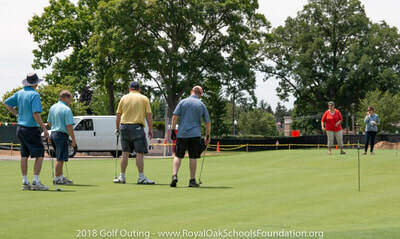 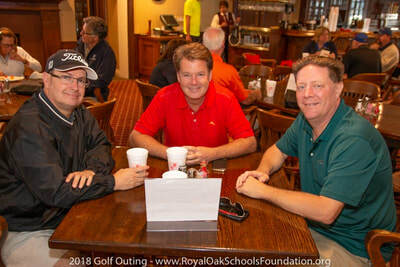 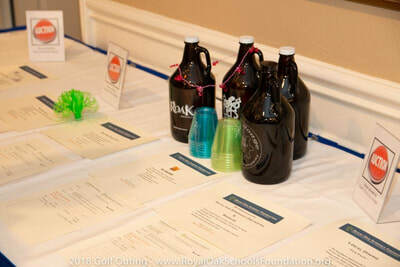 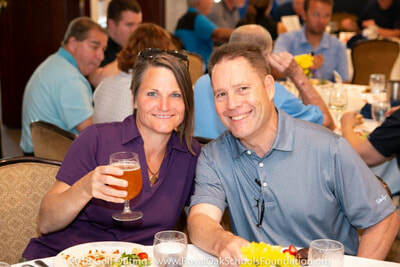 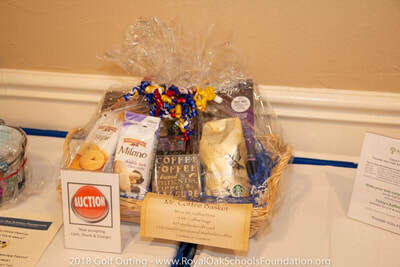 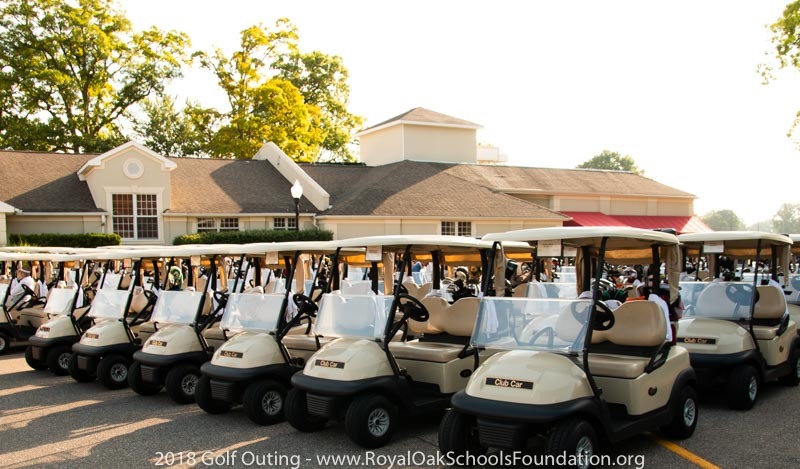 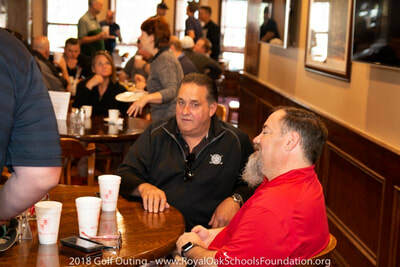 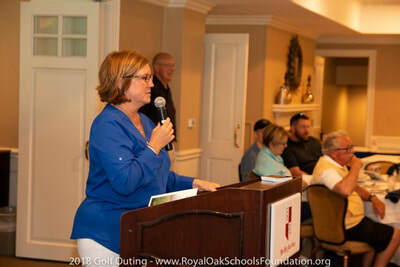 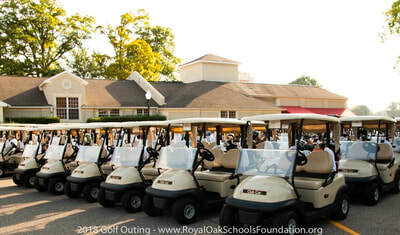 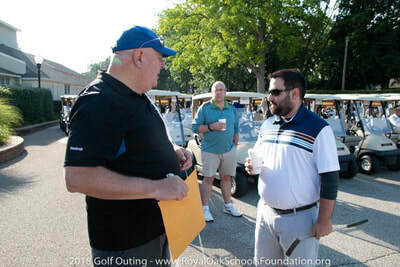 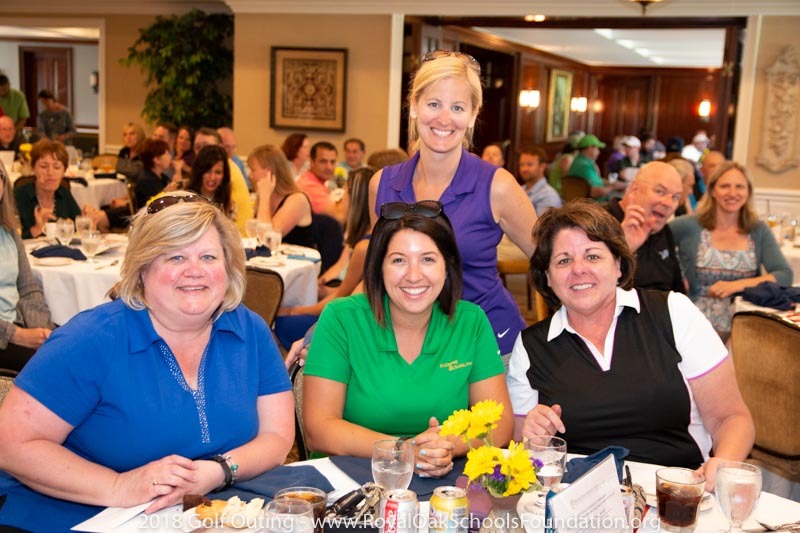 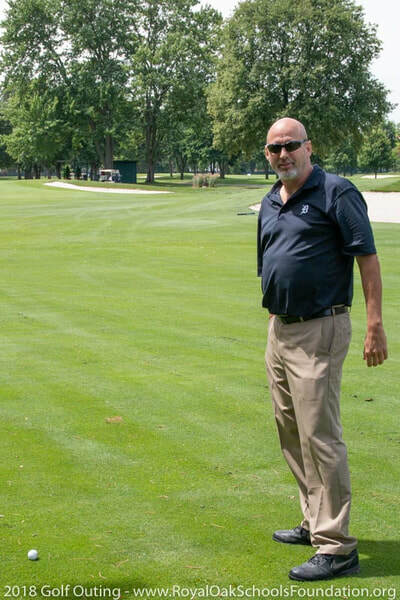 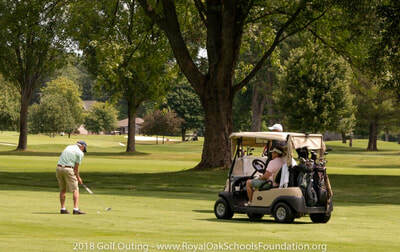 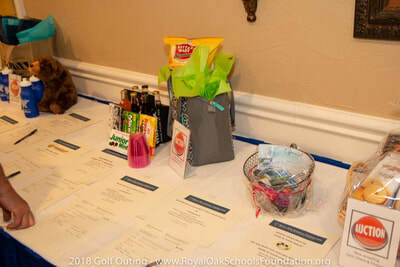 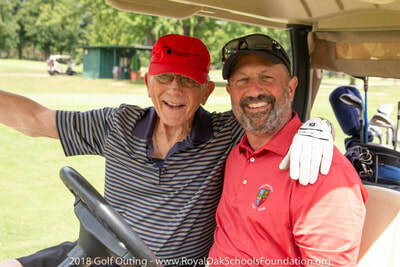 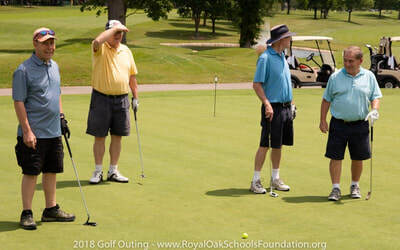 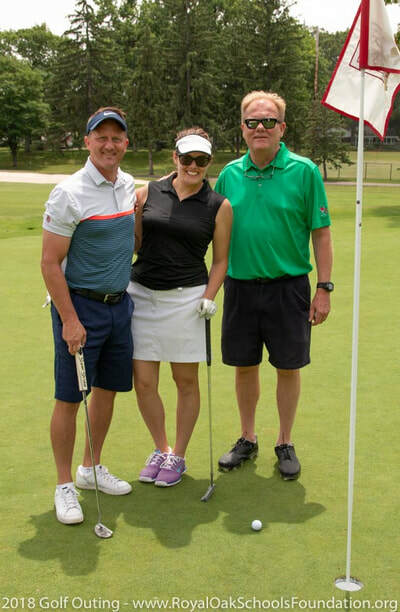 The 25th annual Royal Oak Schools Golf Outing was even more successful than last year. We knew we were in for a good day when 129 golfers signed up to play. 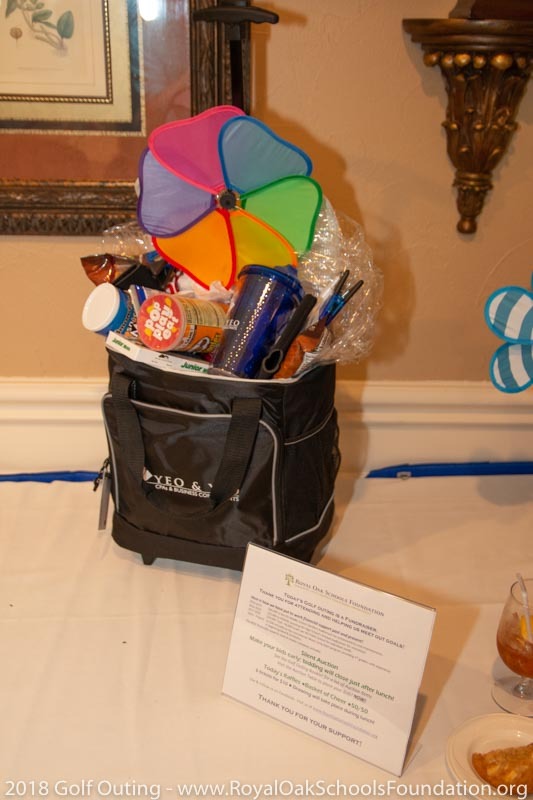 We had more sponsors than last year AND more items in our Silent Auction (25), from Pizza for a Year to a Foursome of Golf at Red Run with dinner. That means that we will raise more money for the Royal Oak Schools Foundation and our mission to enhance all the schools learning environment, to help the teachers and support staff provide the best educational experiences possible at Royal Oak Schools. 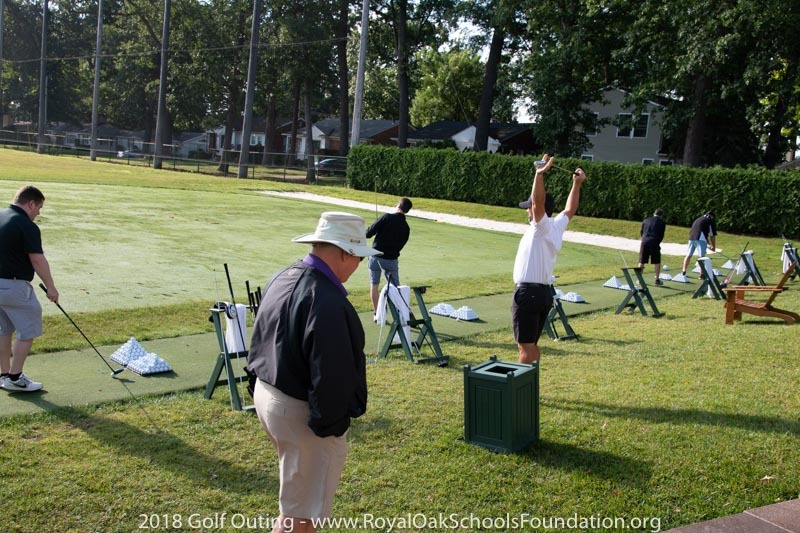 The weather was perfect, starting with a brisk morning shotgun start getting progressively warmer all day without a drop of rain. 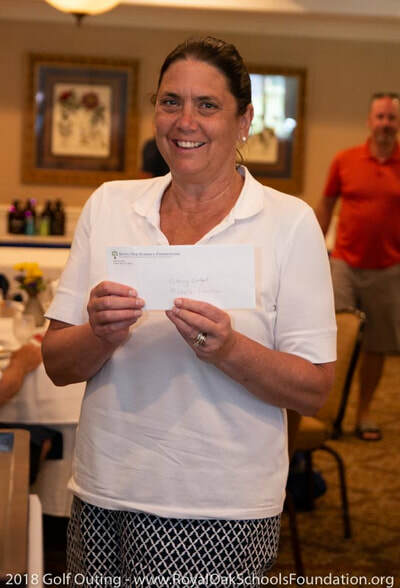 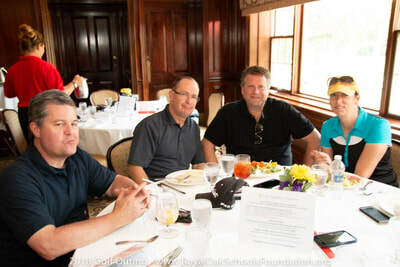 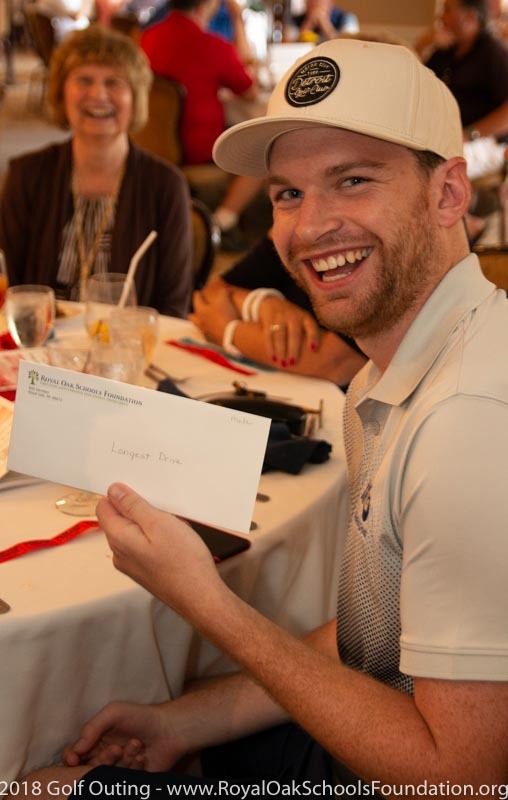 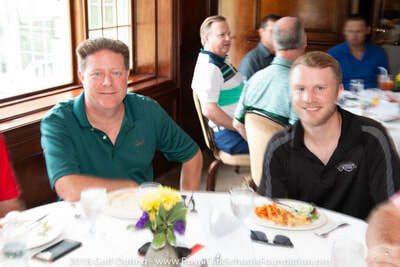 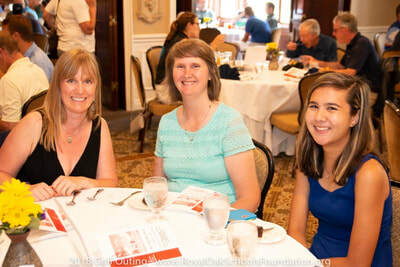 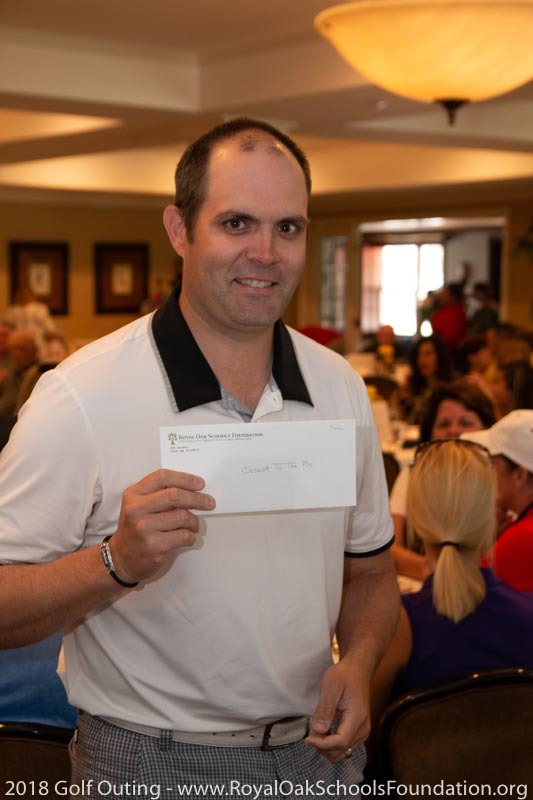 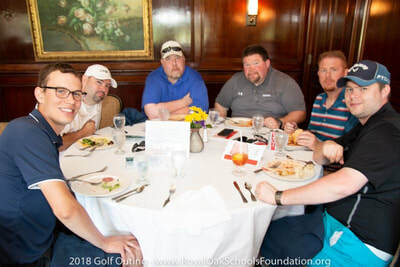 After trying to get the best score, the longest drive, closest to the pin or winning the putting contest, teams turned in their scorecards and enjoyed a lovely luncheon at Red Run. 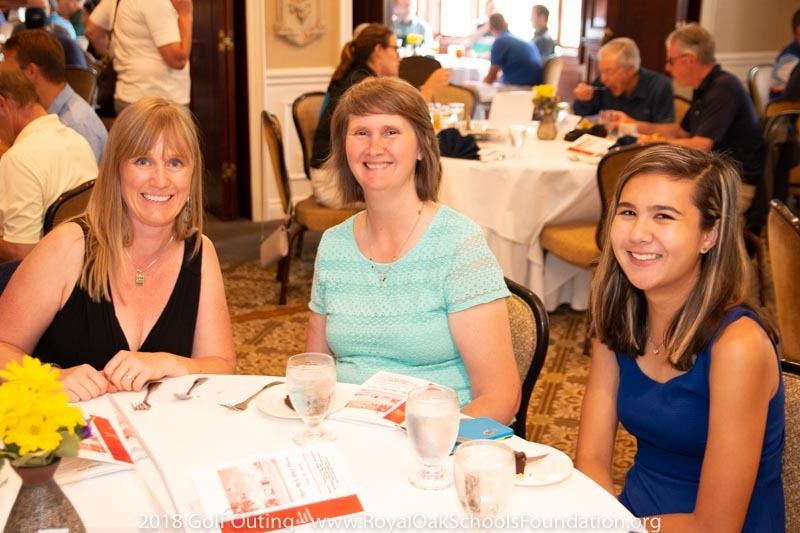 We were joined by two of the four 2018 Teacher of the Year recipients and one of our Dan Champagne Memorial Scholarship recipients who were recognized by everyone in attendance. 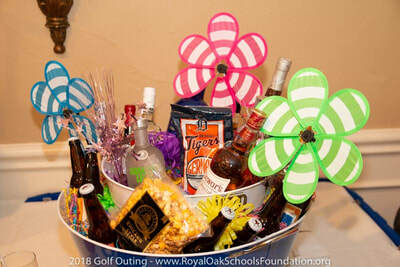 A 50/50 raffle and "Basket Of Cheer" were awarded and the winners of the best Male, Female and Co-Ed scores were awarded. 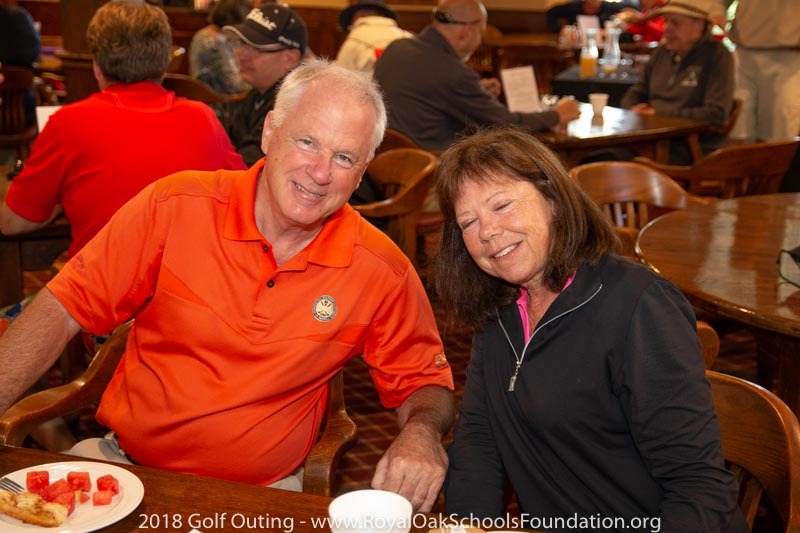 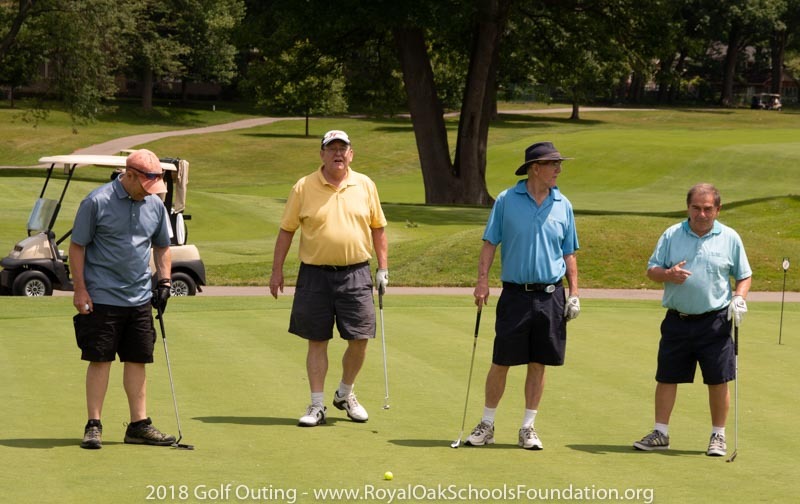 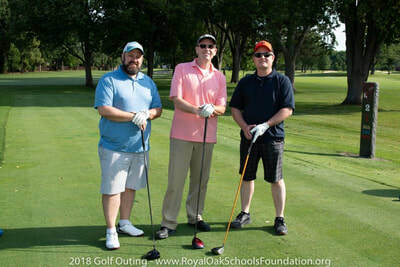 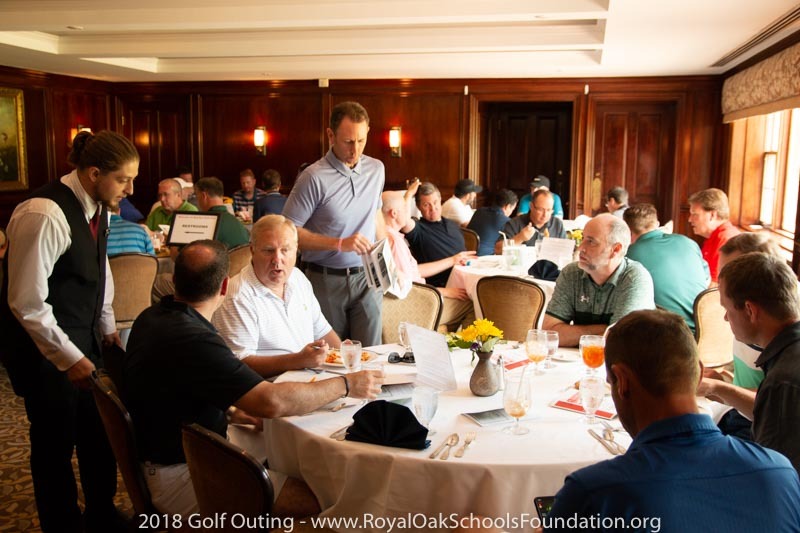 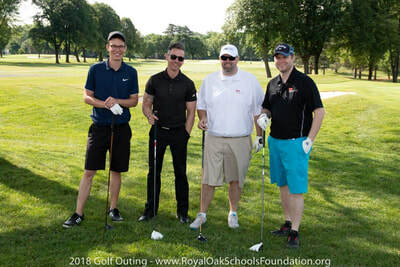 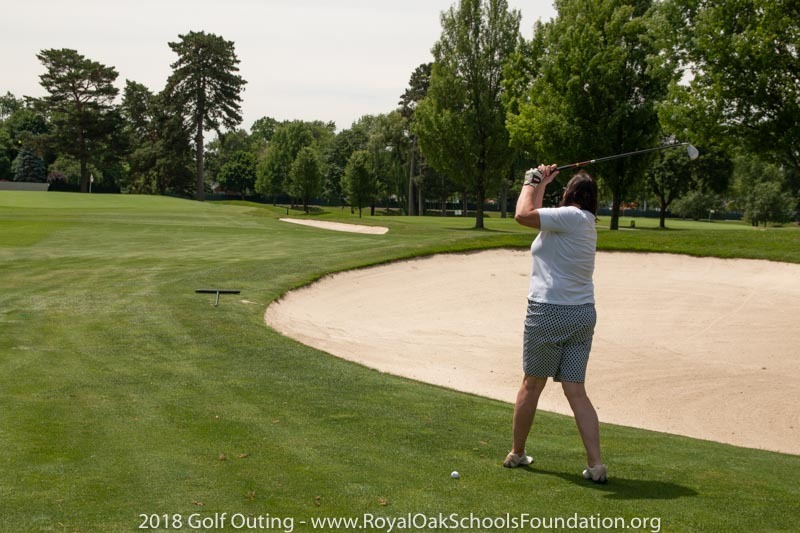 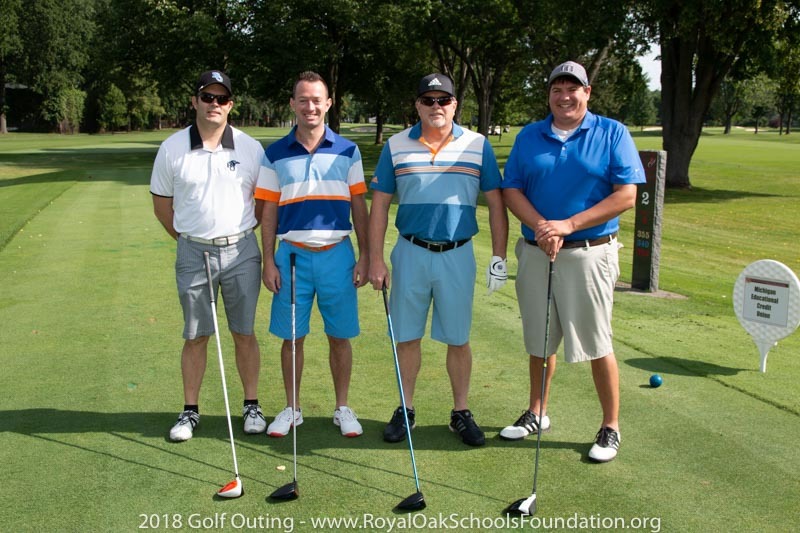 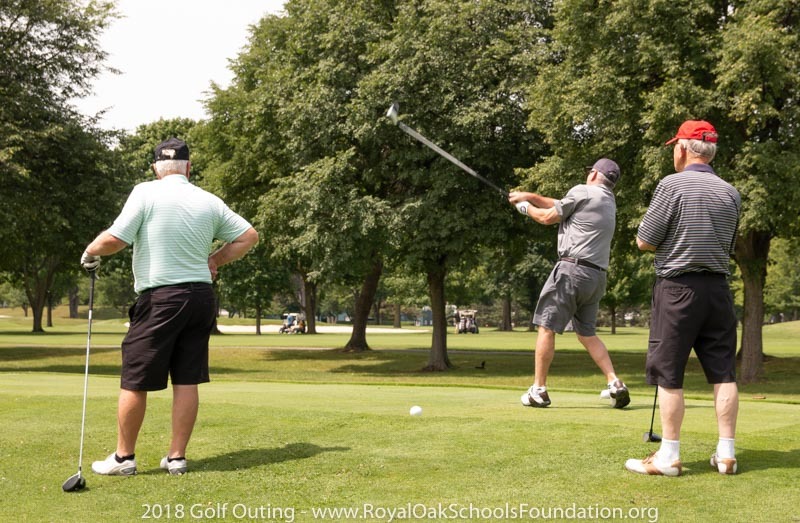 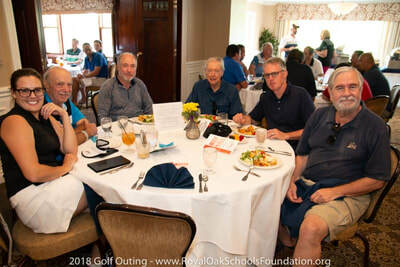 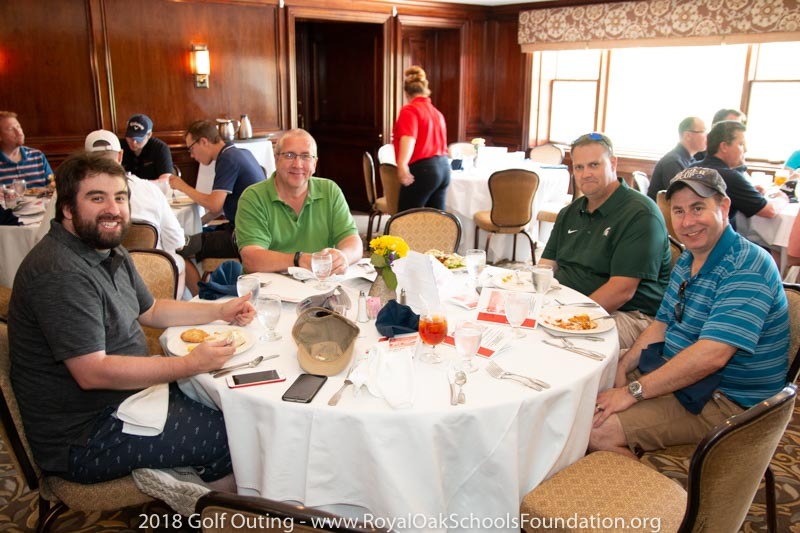 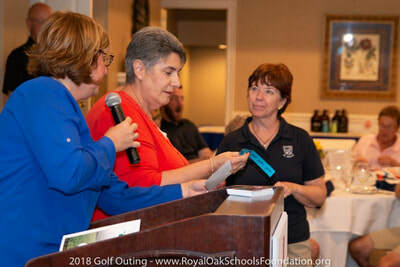 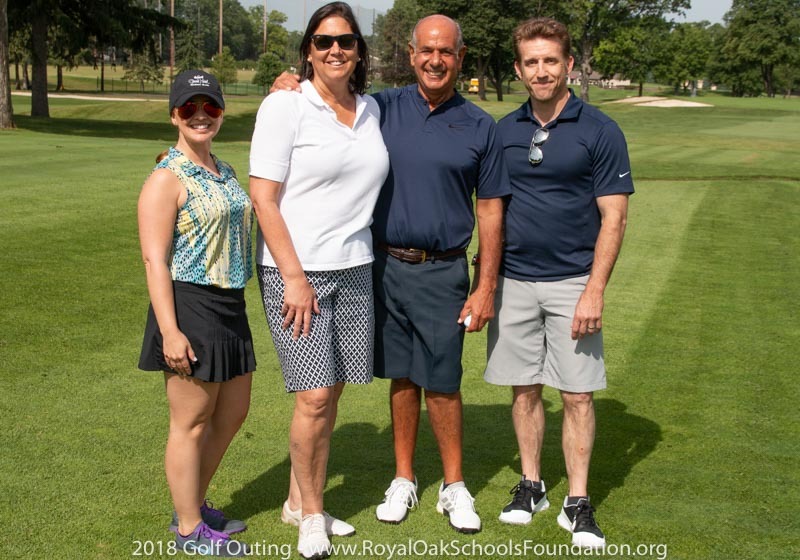 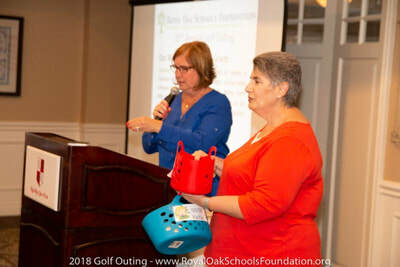 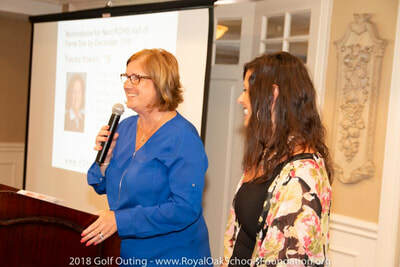 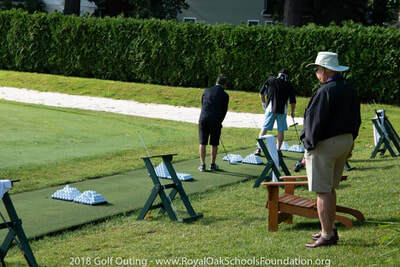 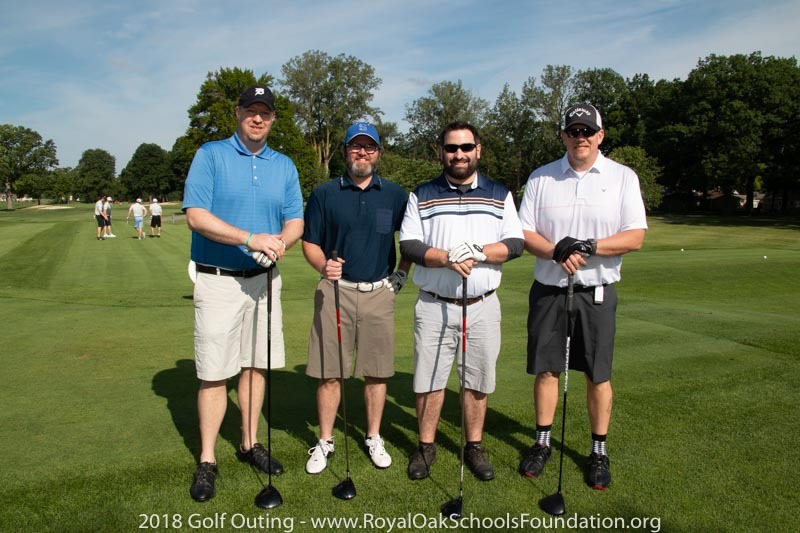 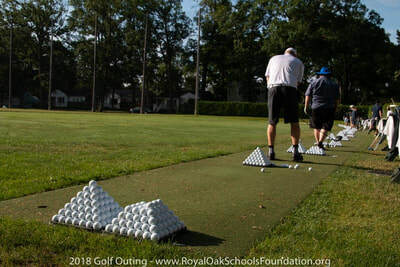 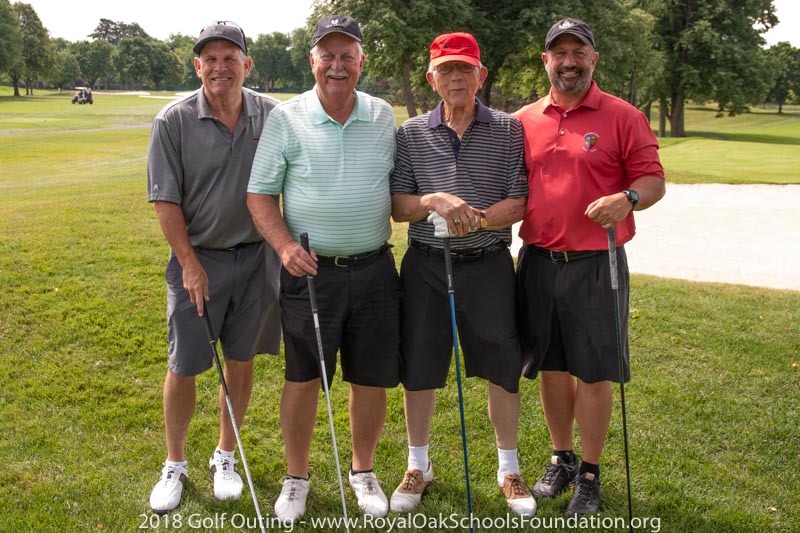 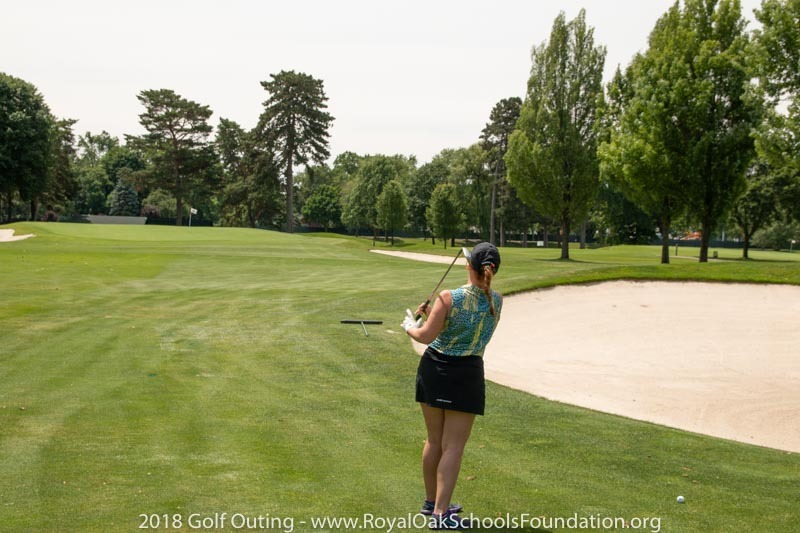 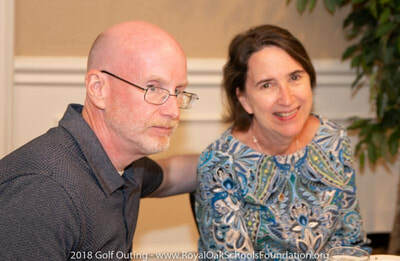 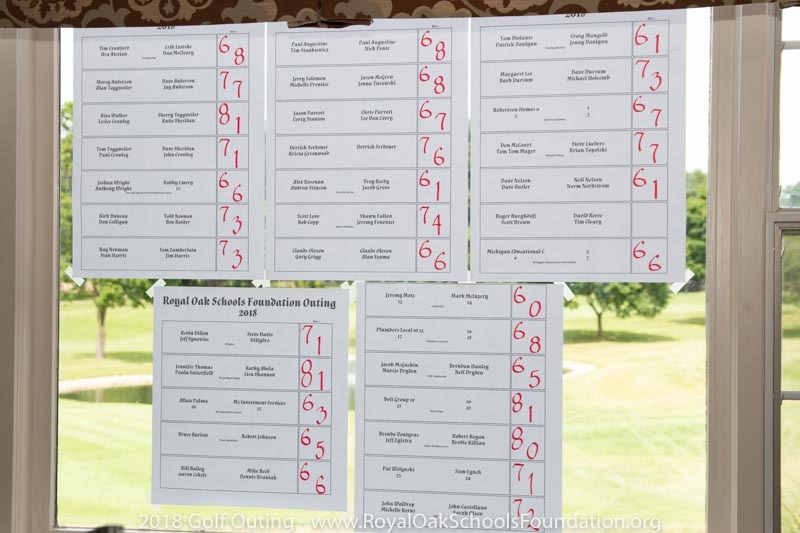 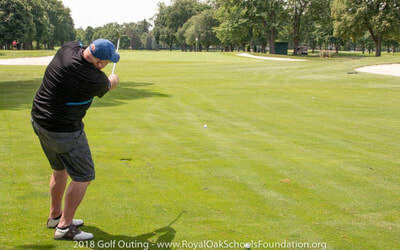 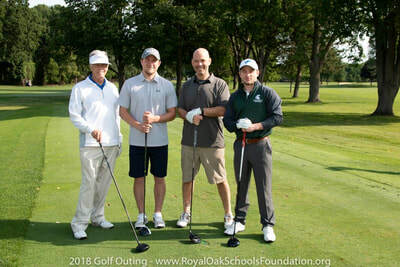 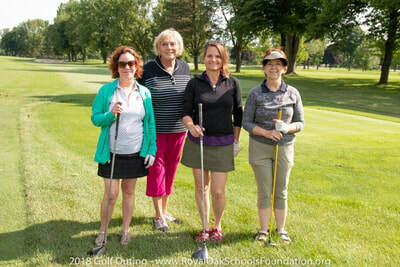 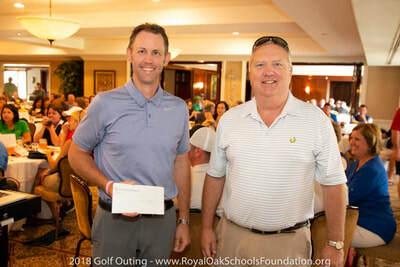 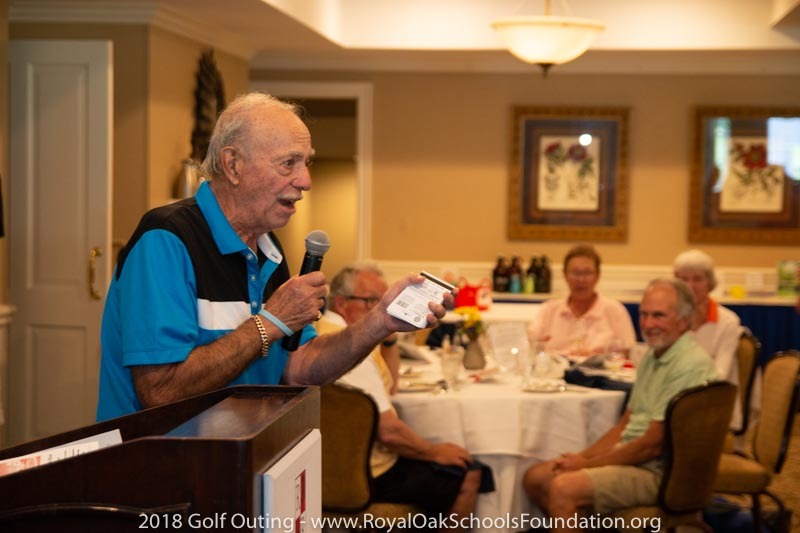 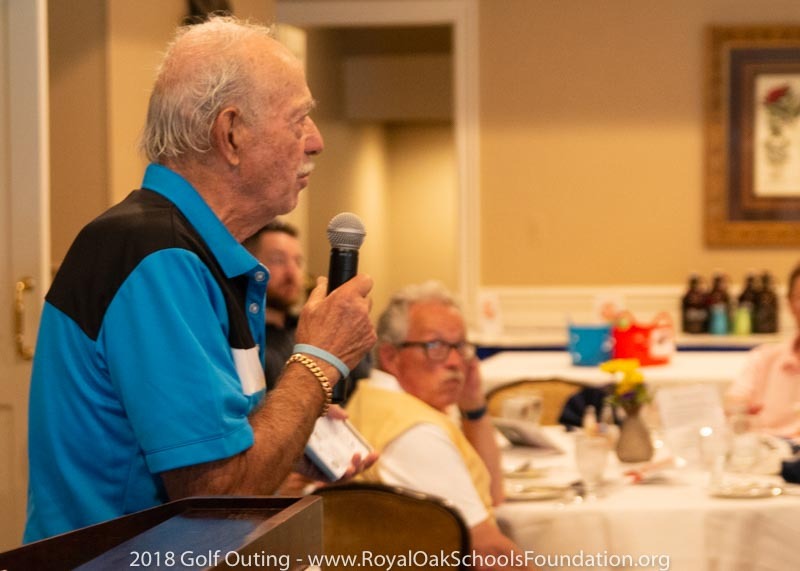 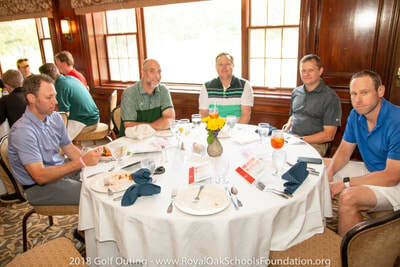 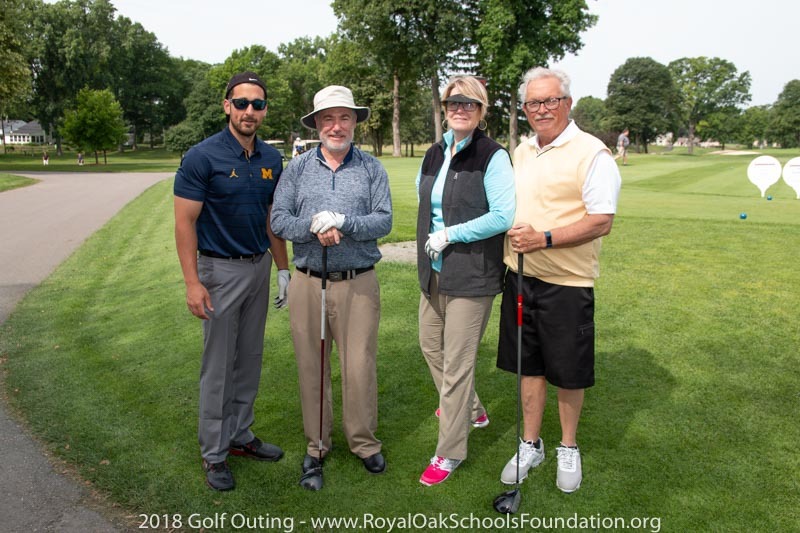 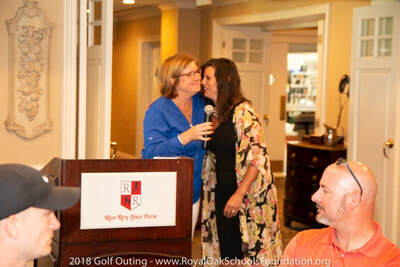 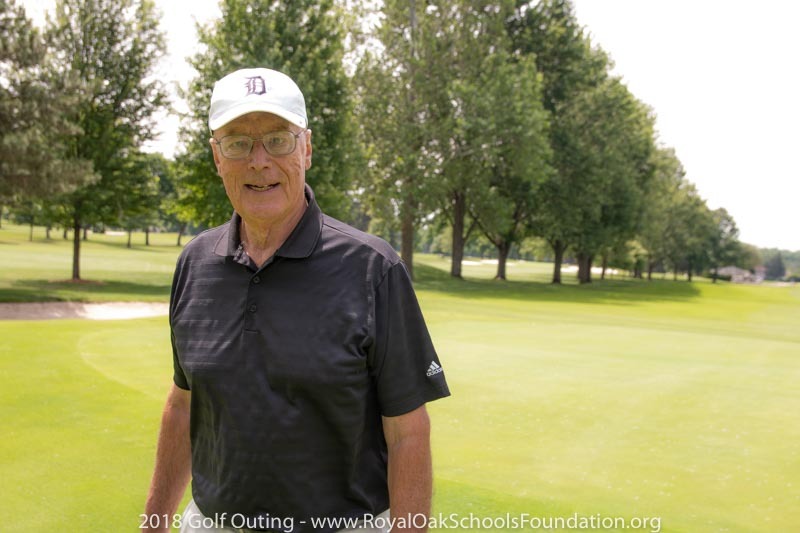 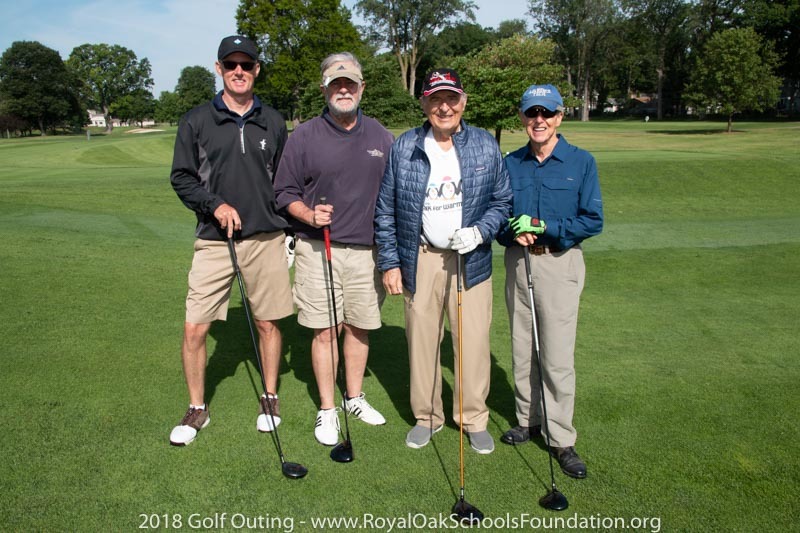 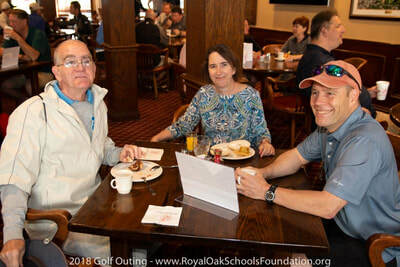 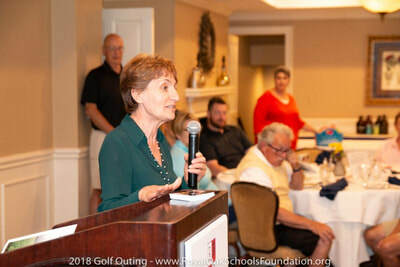 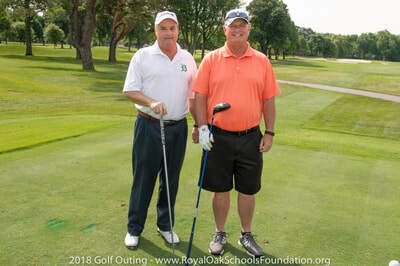 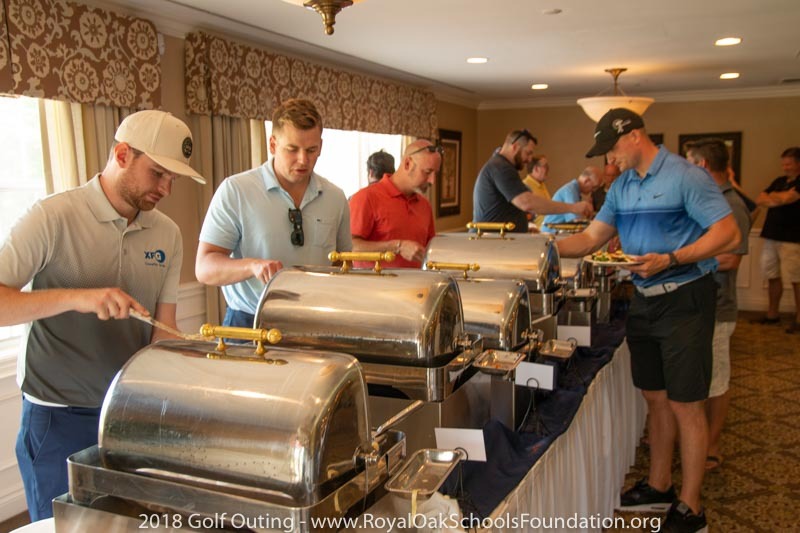 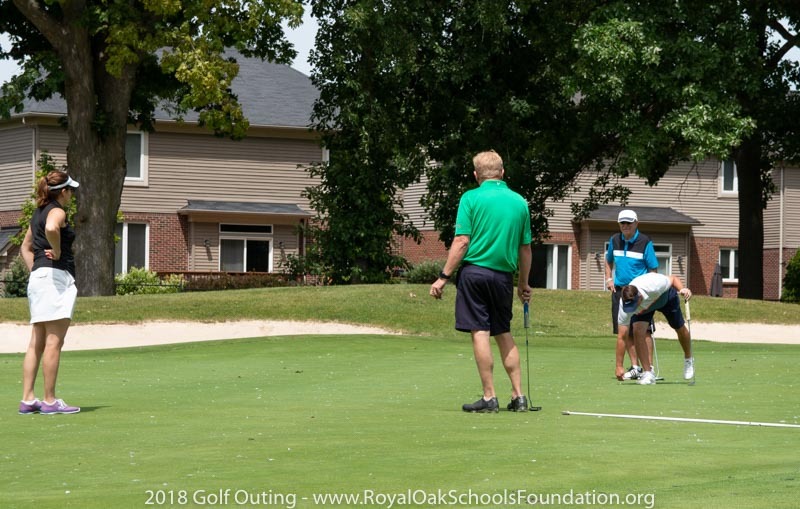 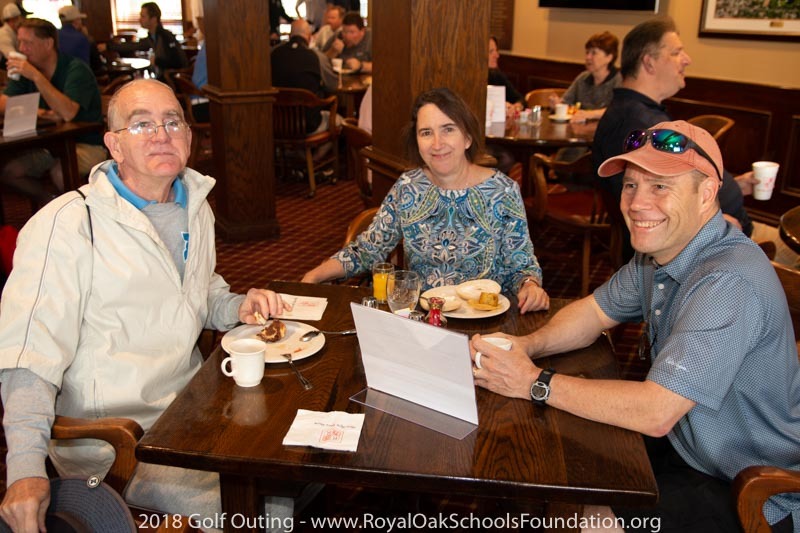 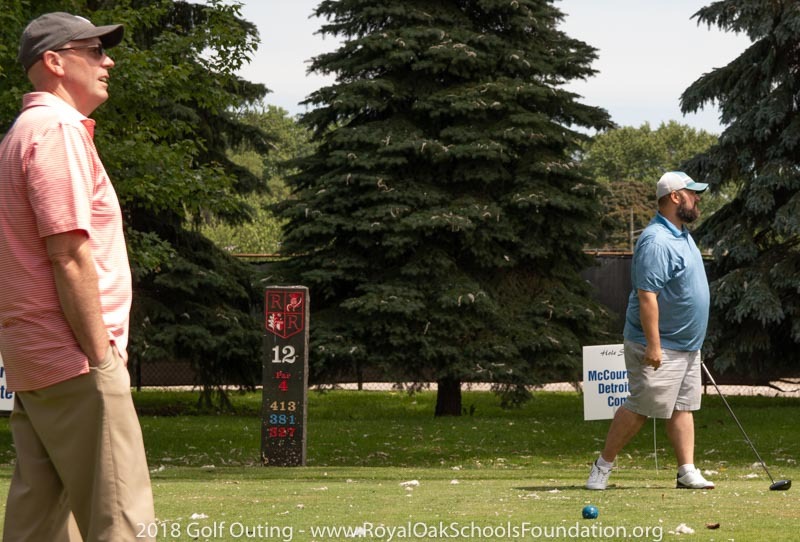 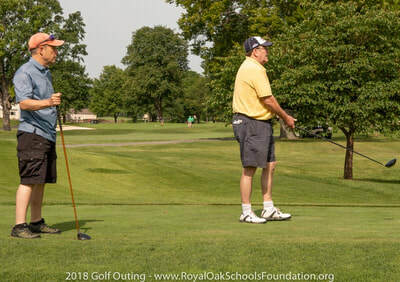 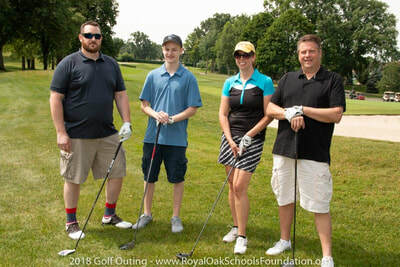 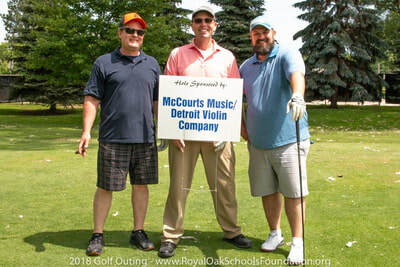 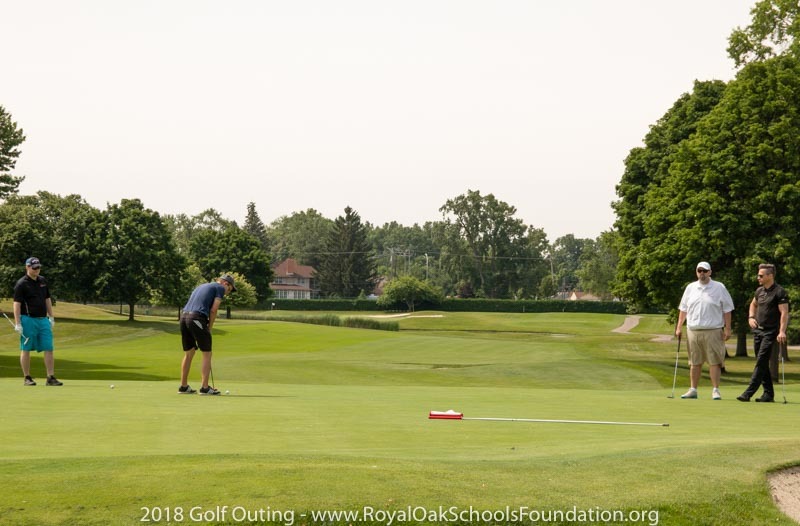 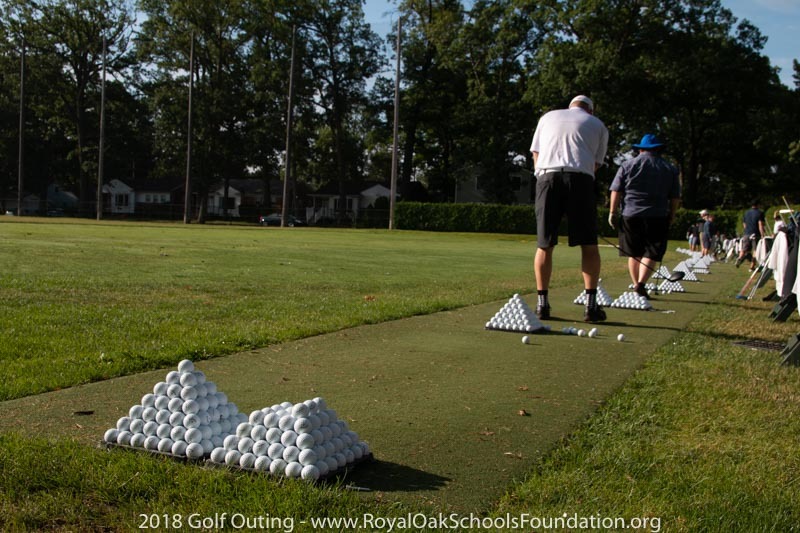 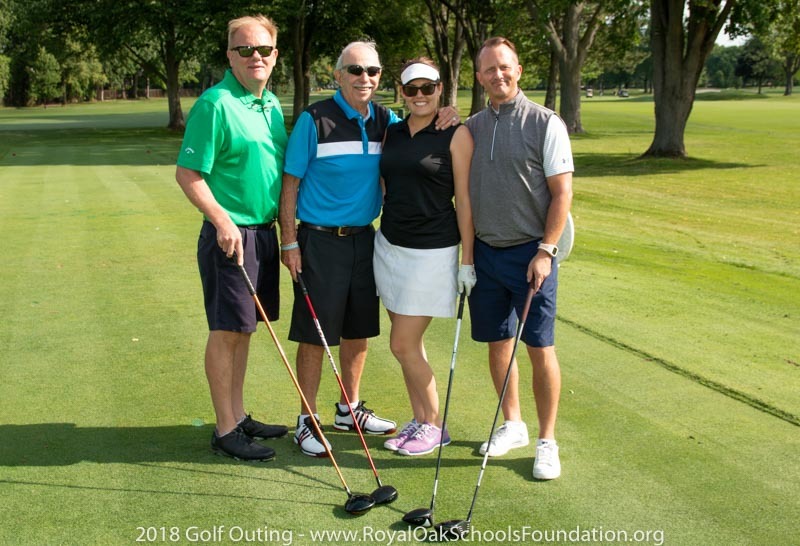 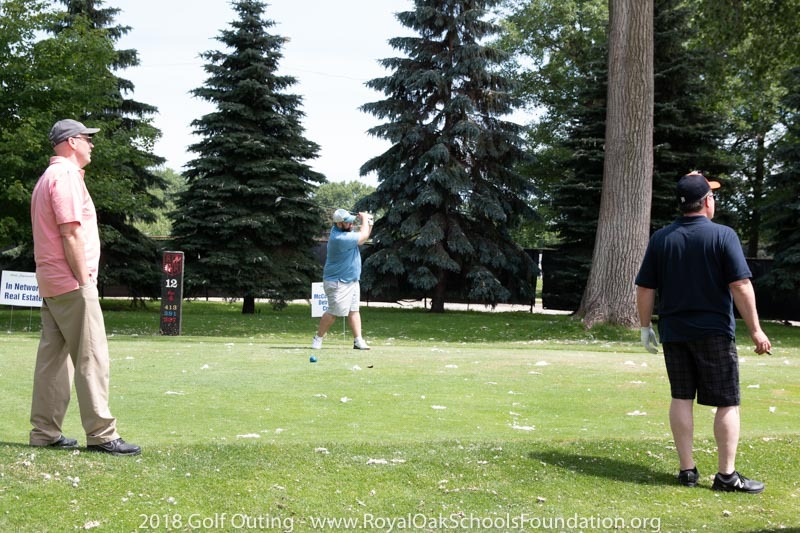 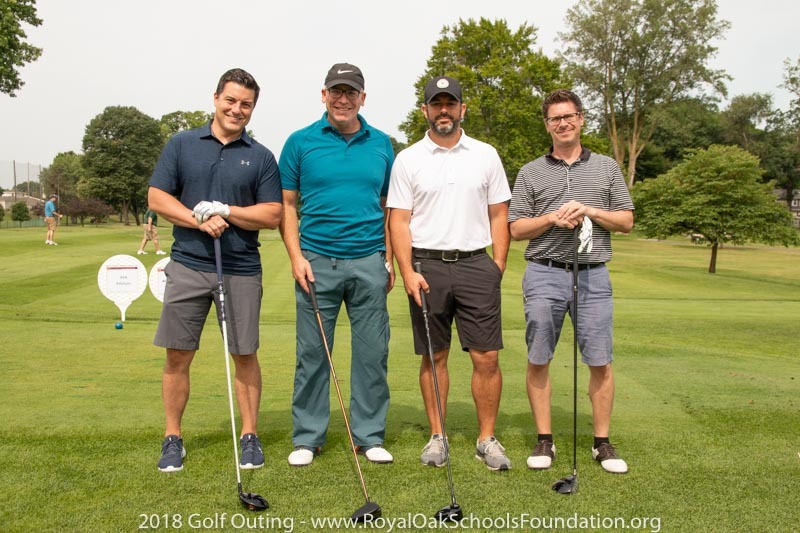 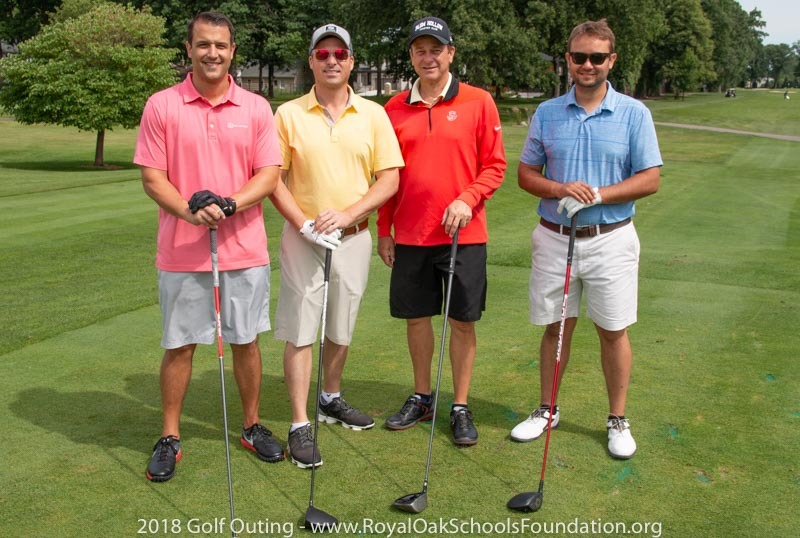 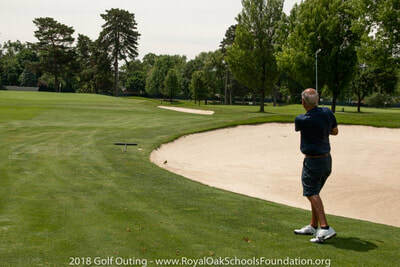 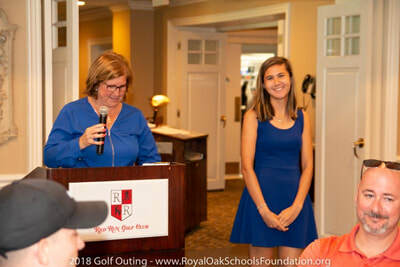 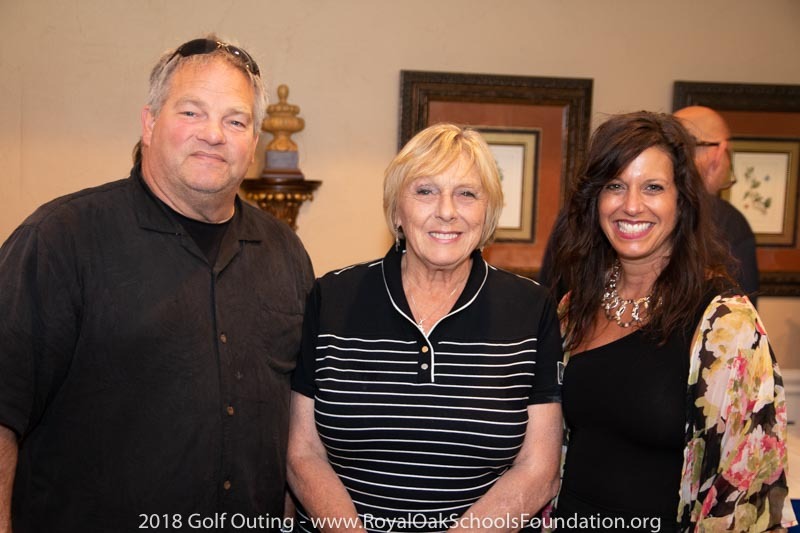 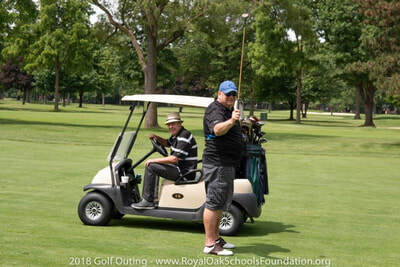 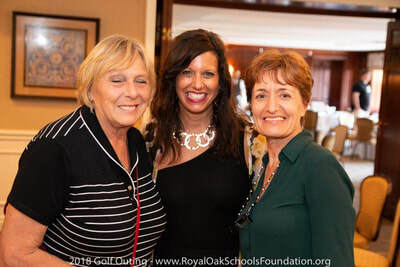 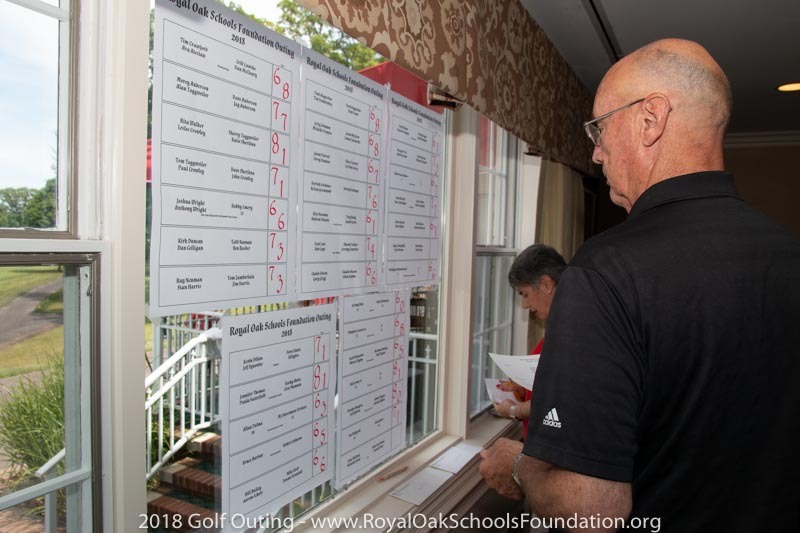 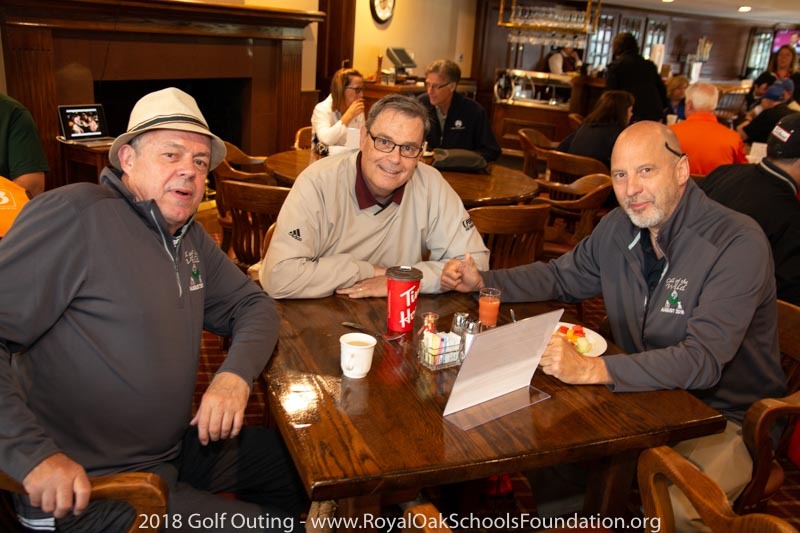 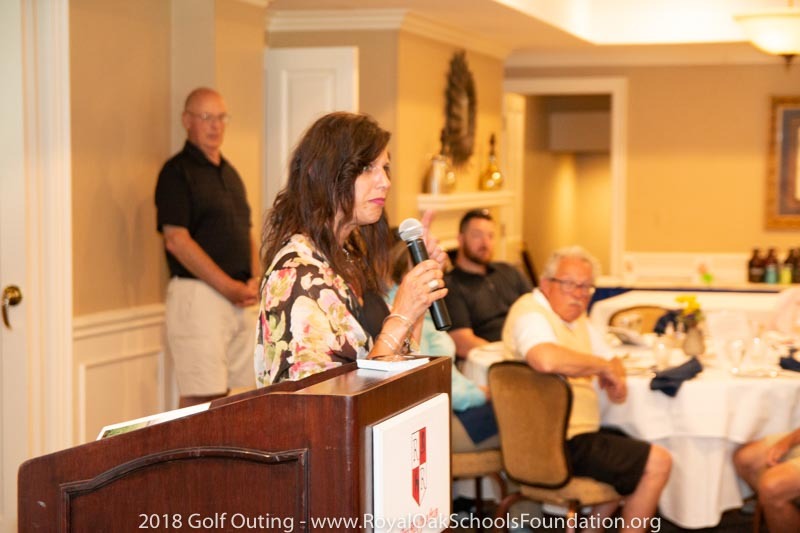 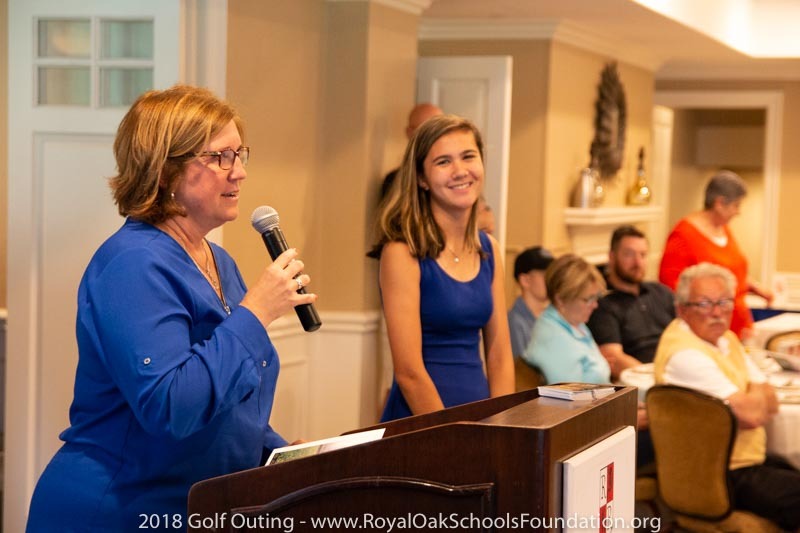 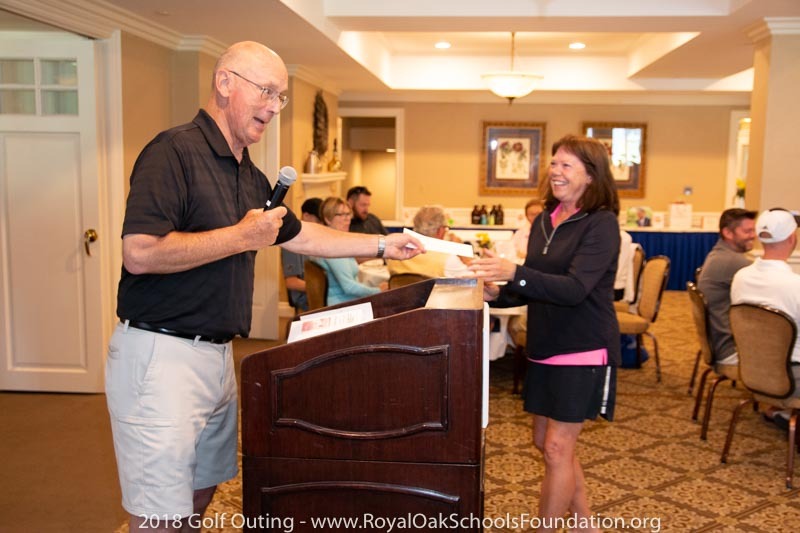 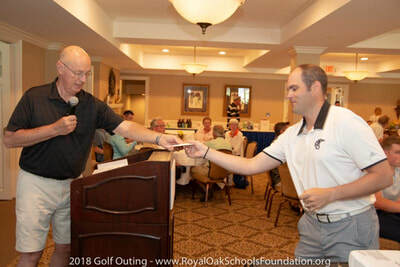 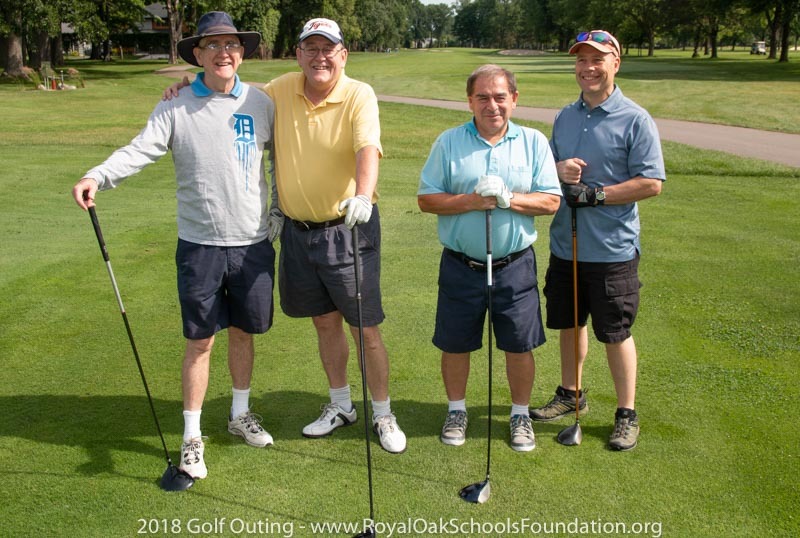 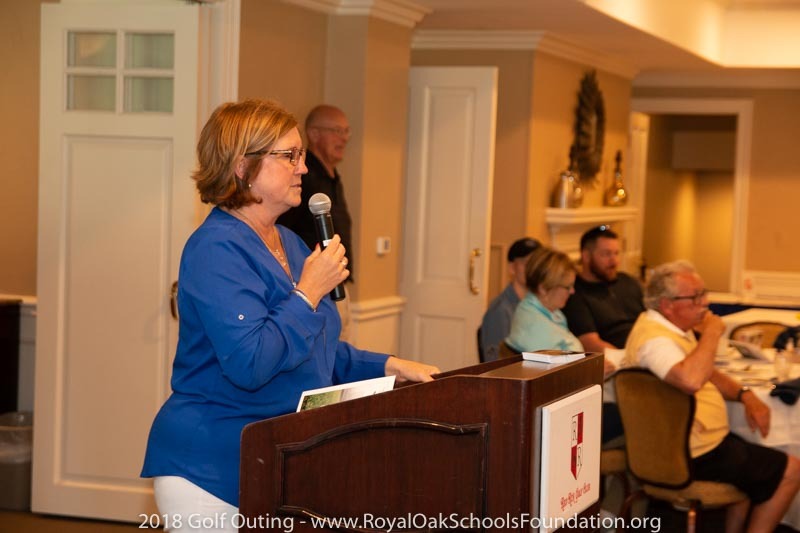 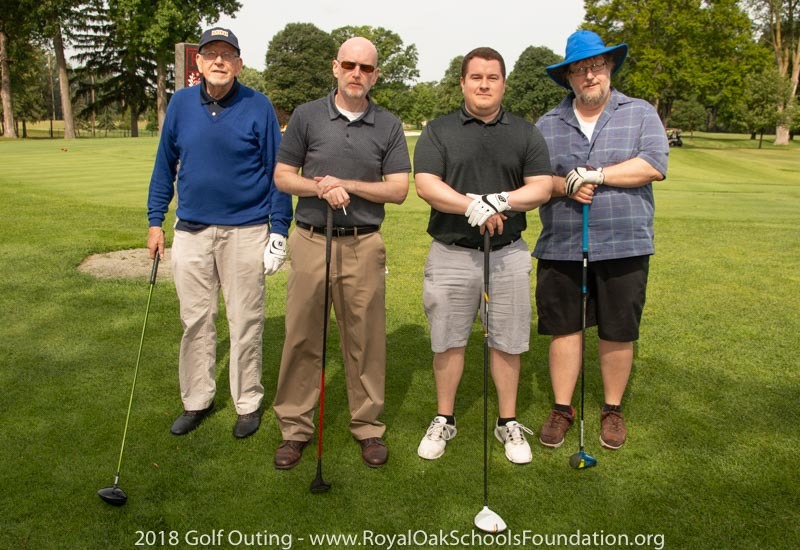 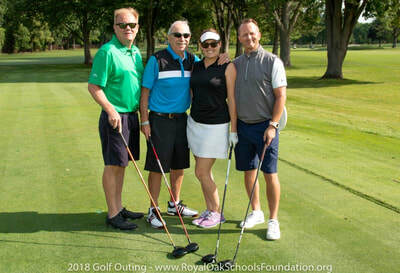 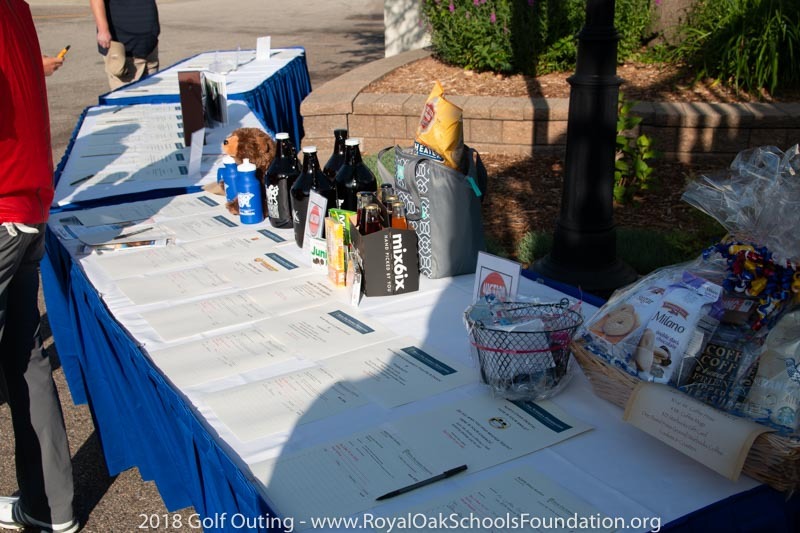 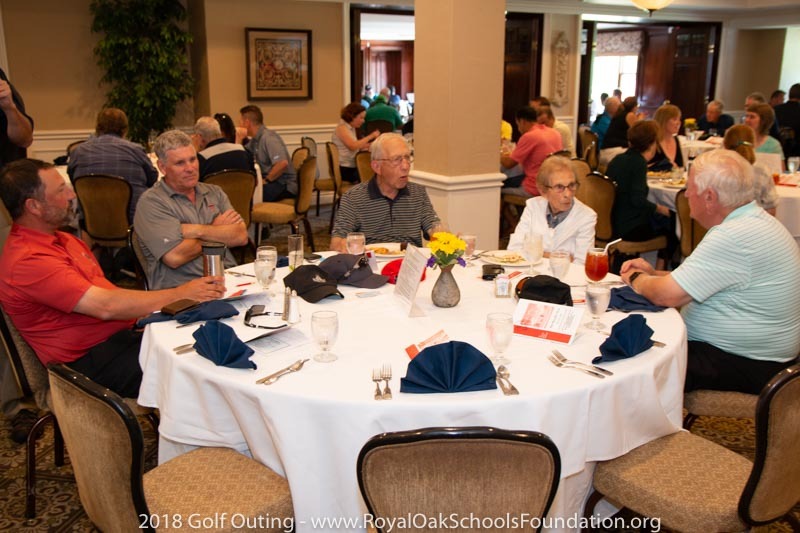 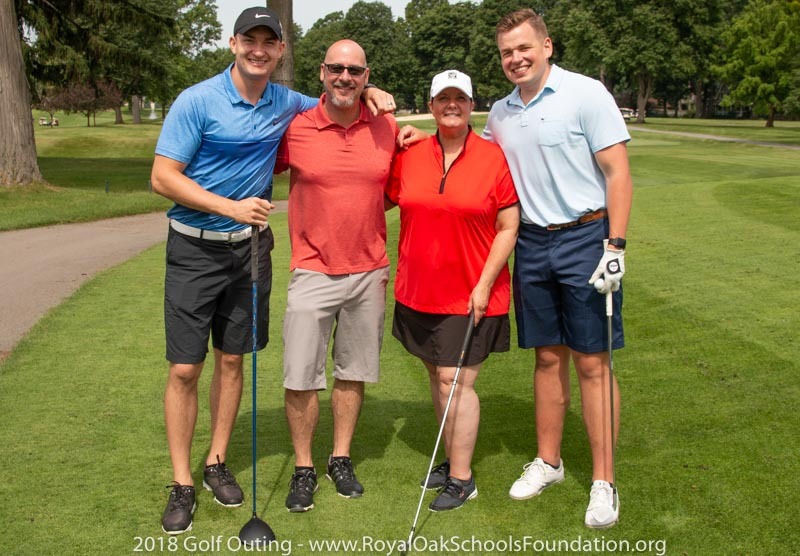 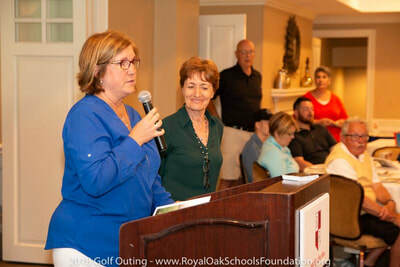 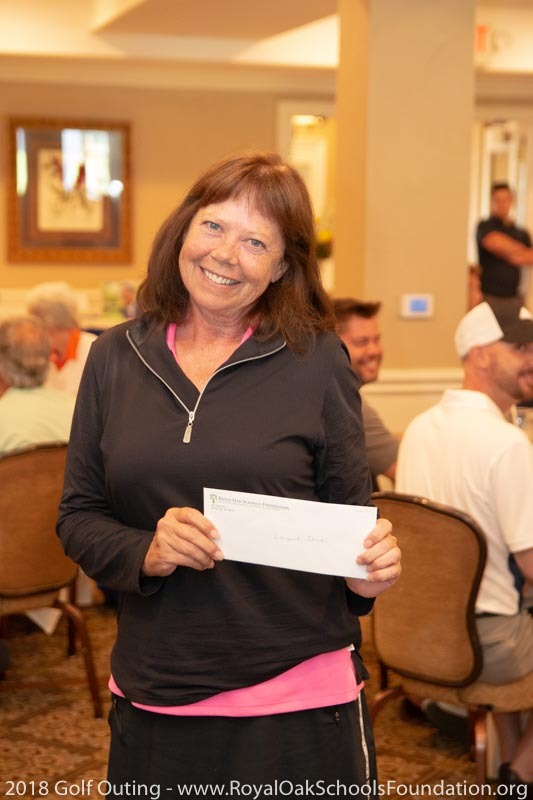 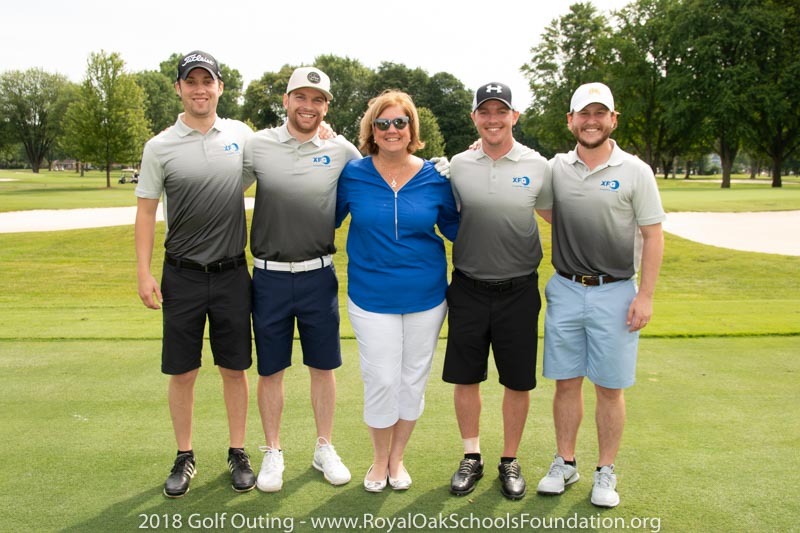 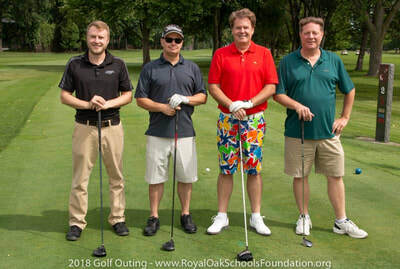 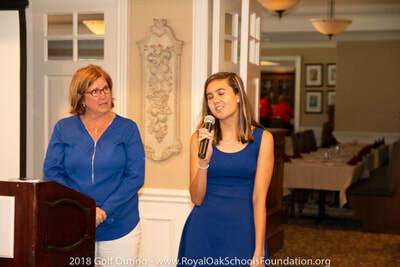 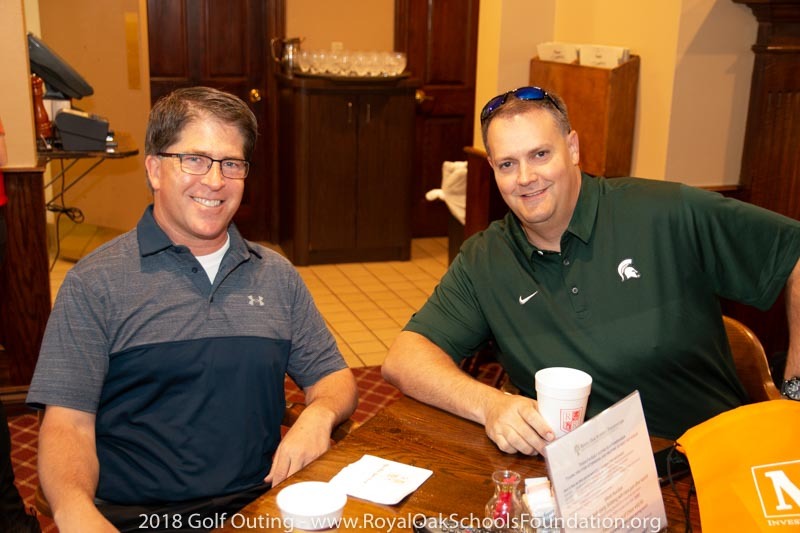 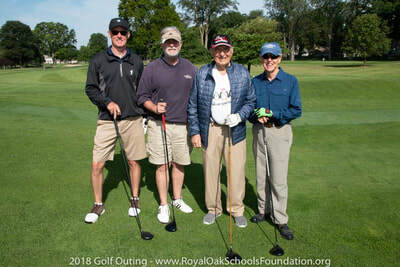 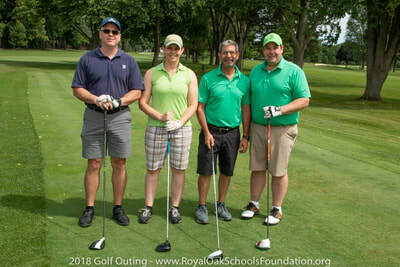 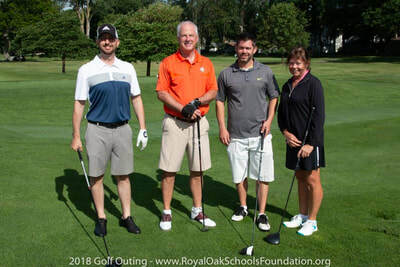 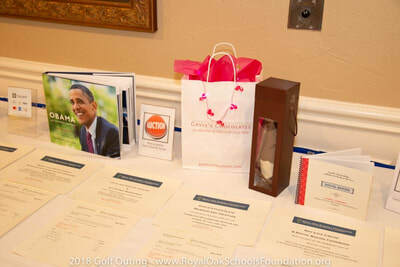 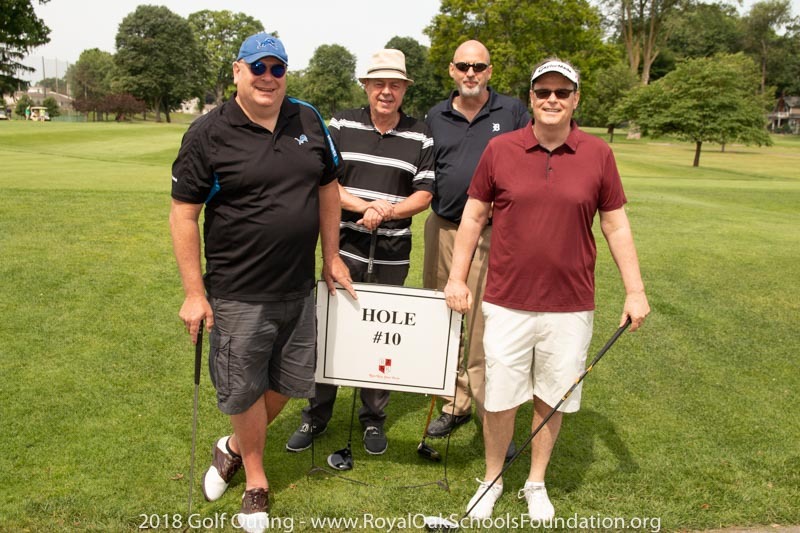 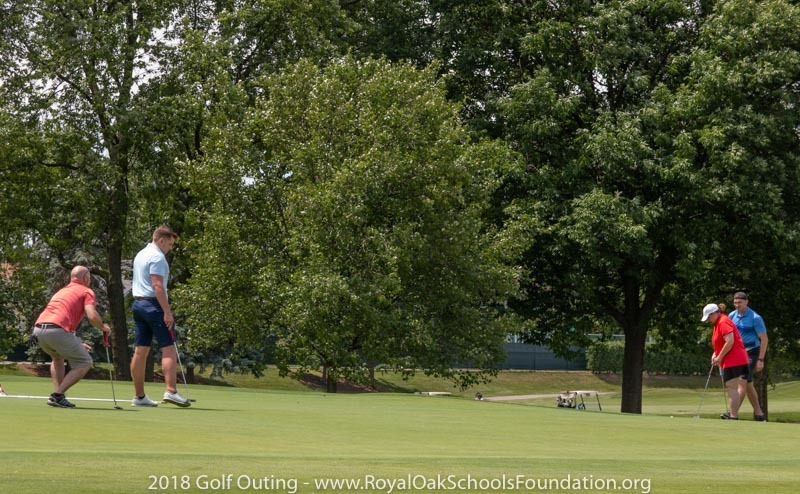 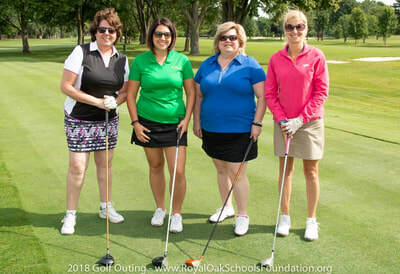 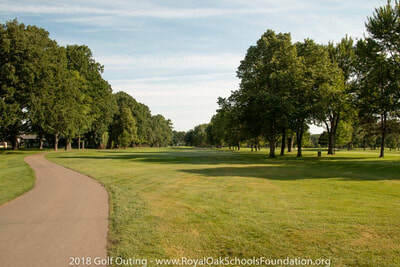 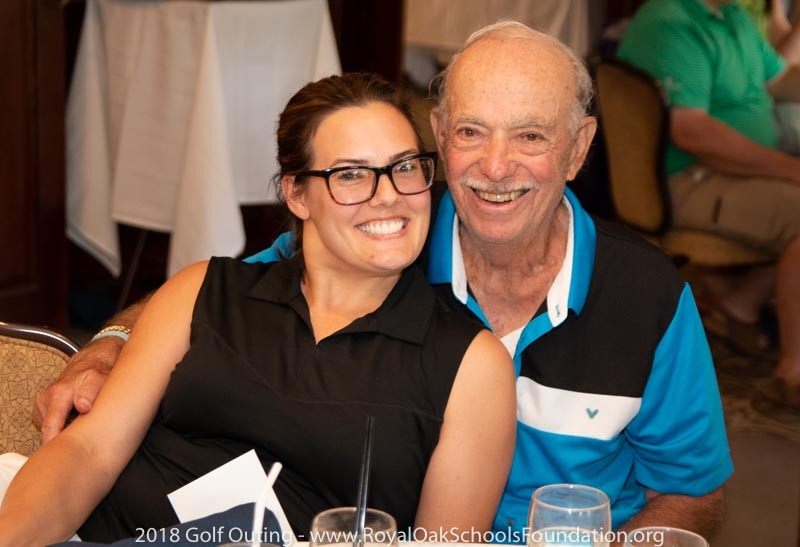 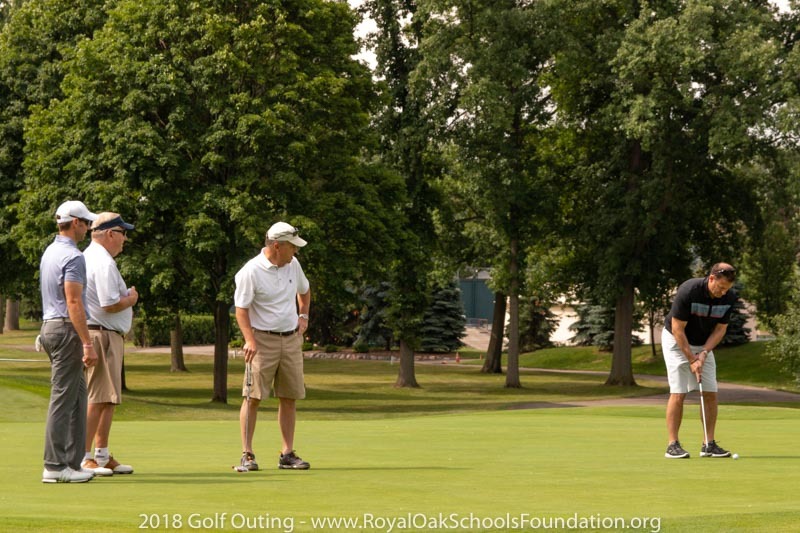 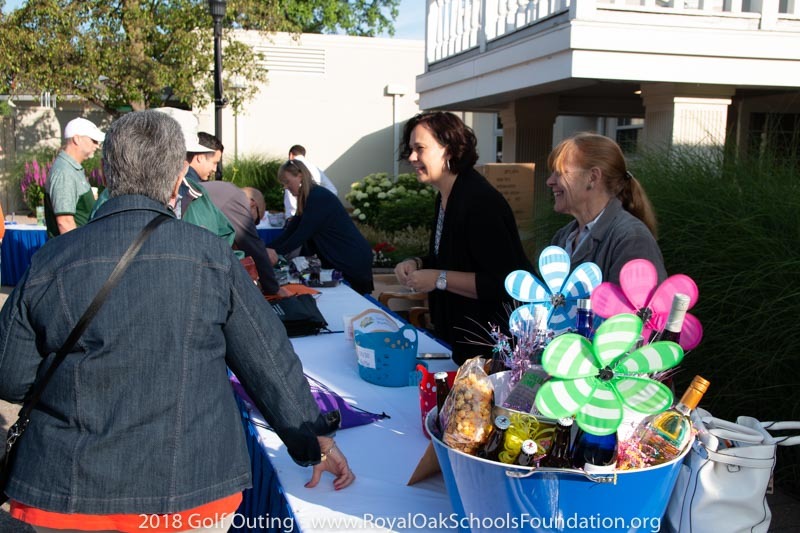 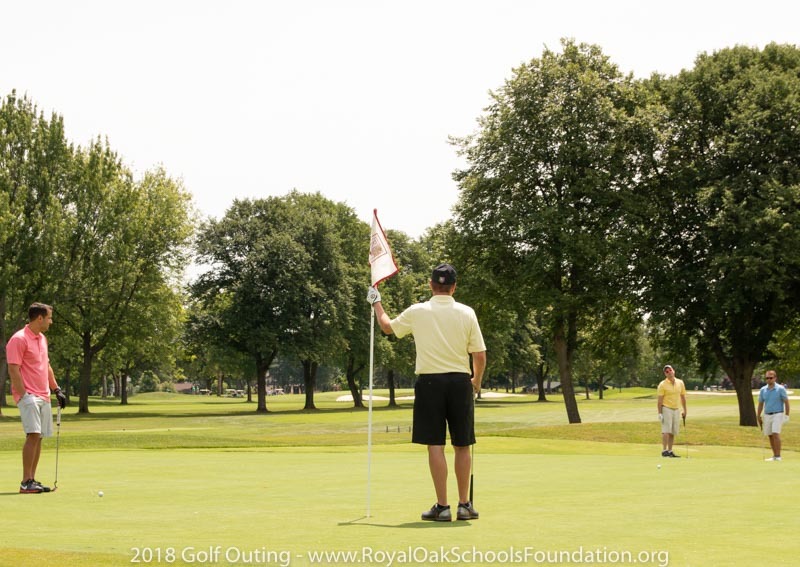 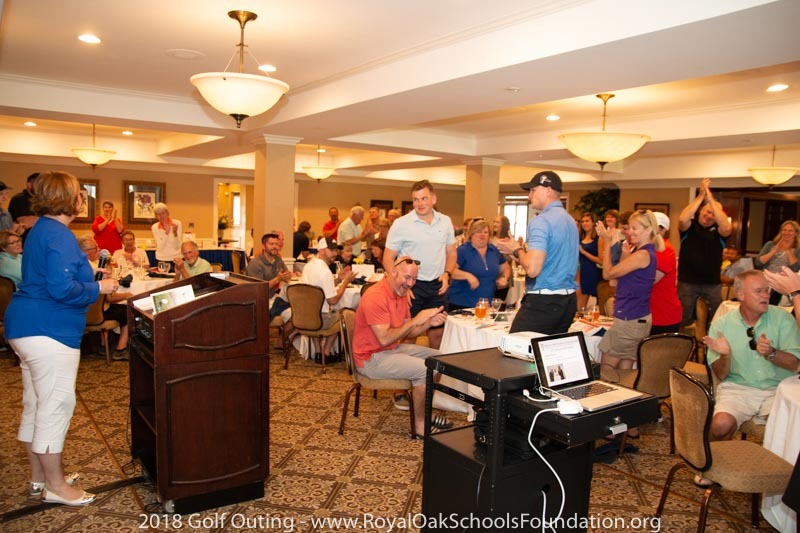 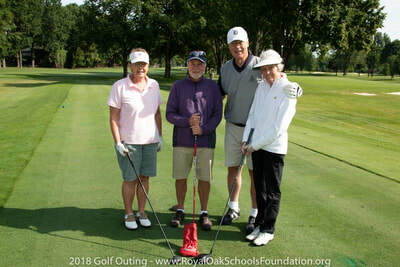 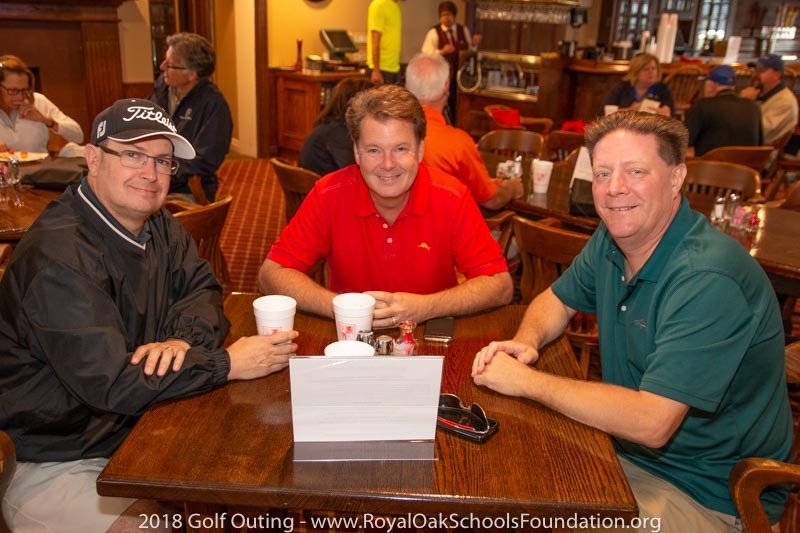 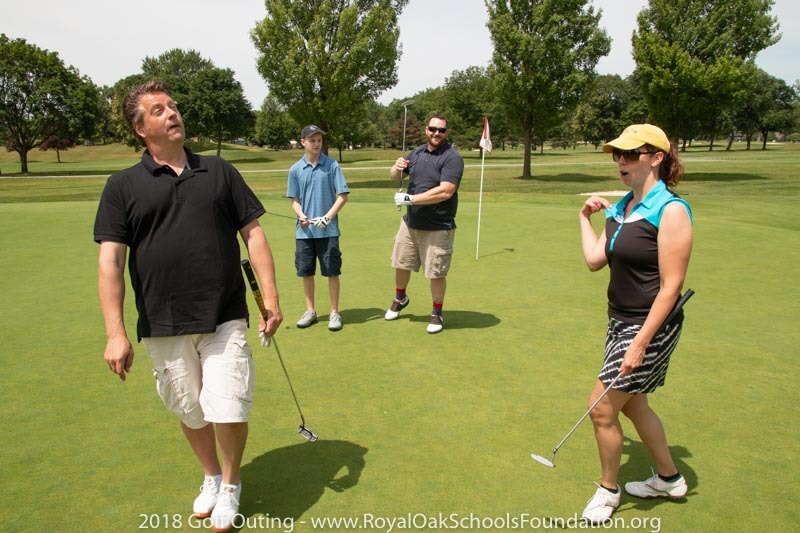 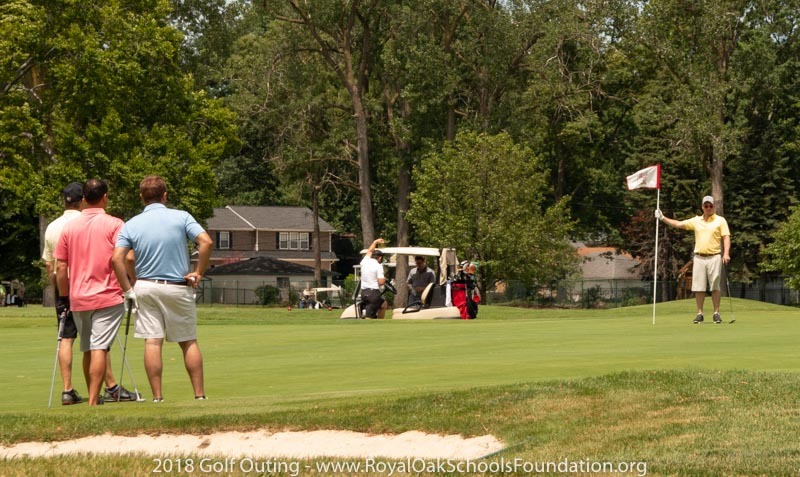 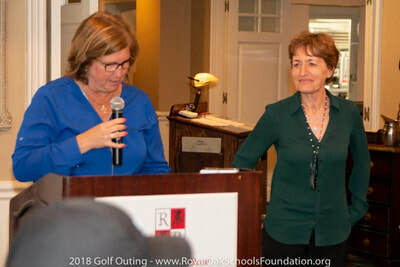 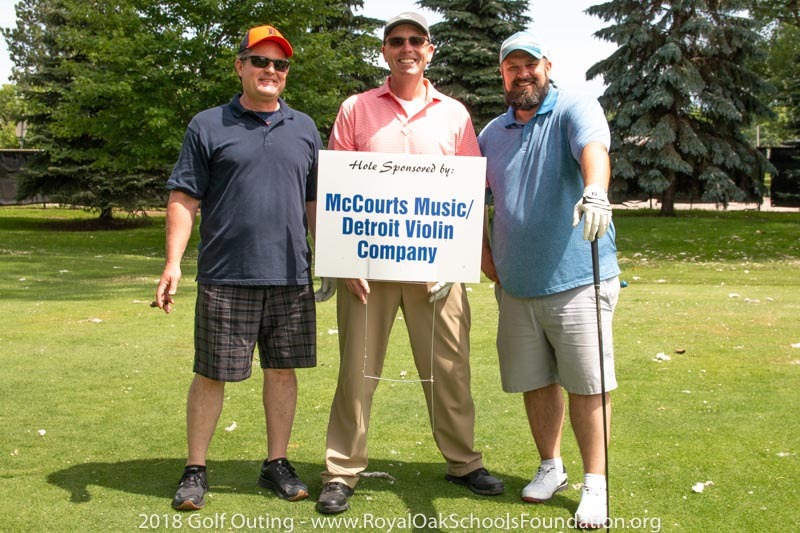 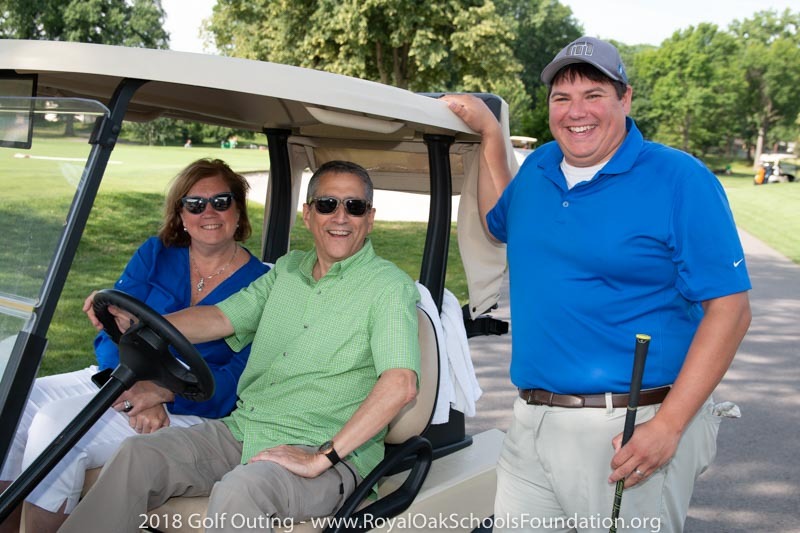 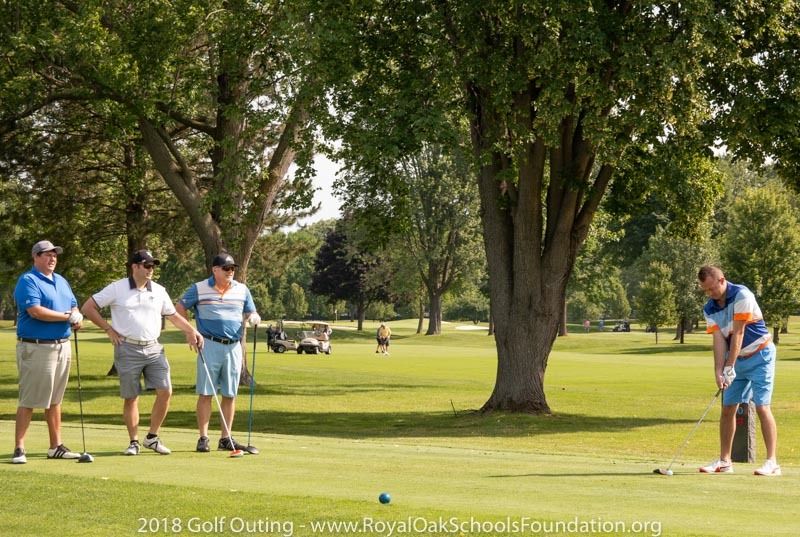 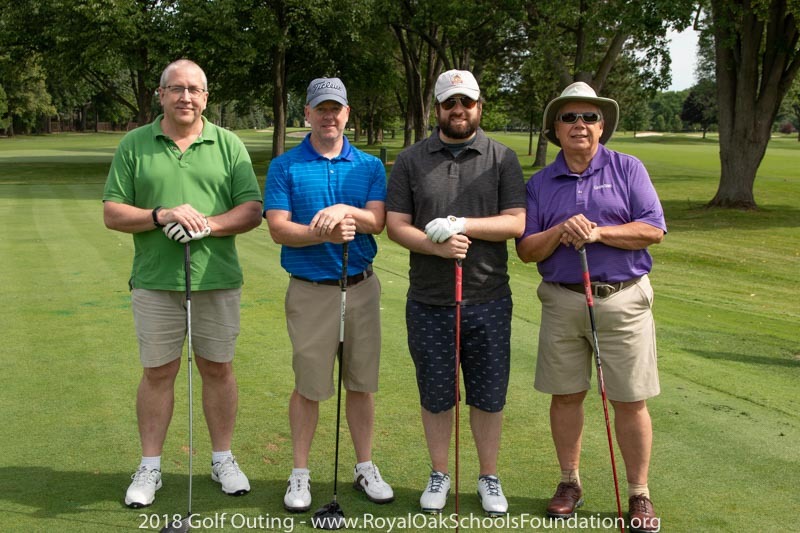 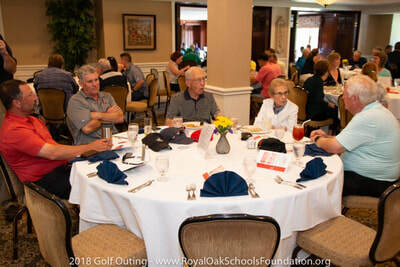 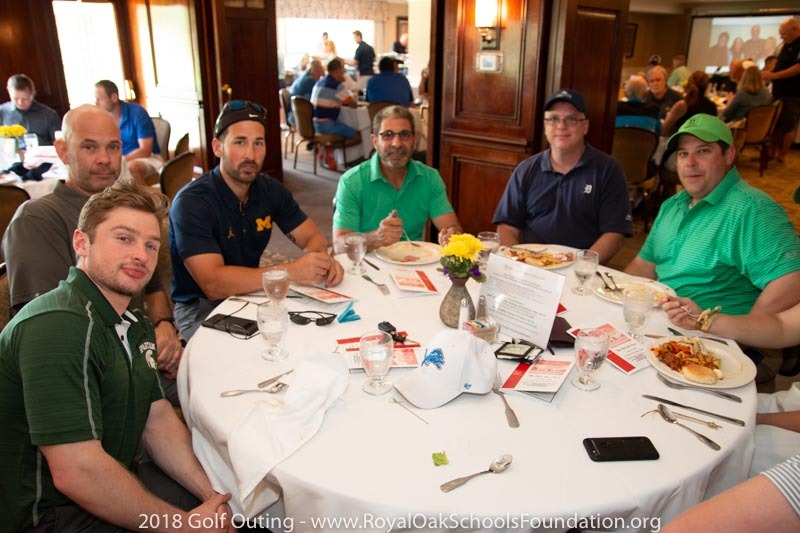 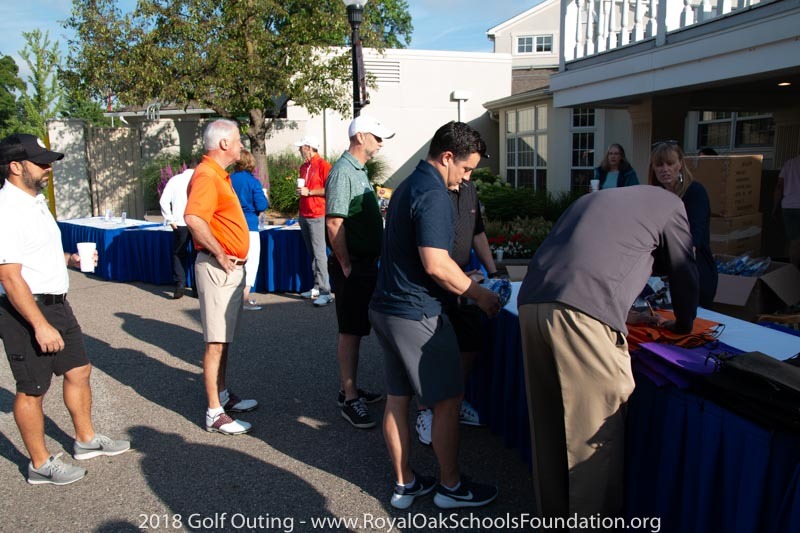 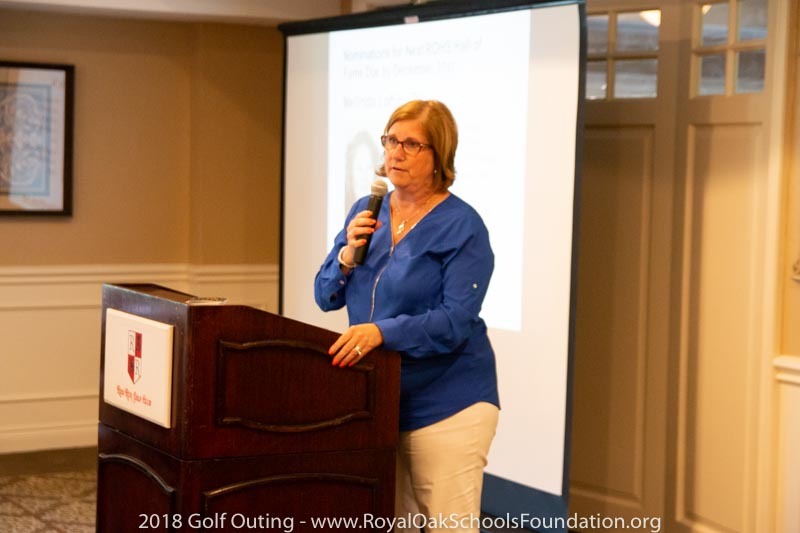 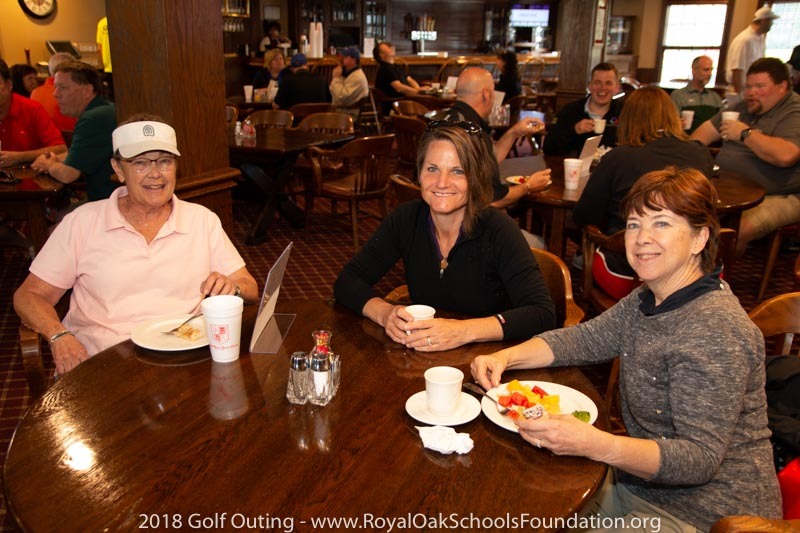 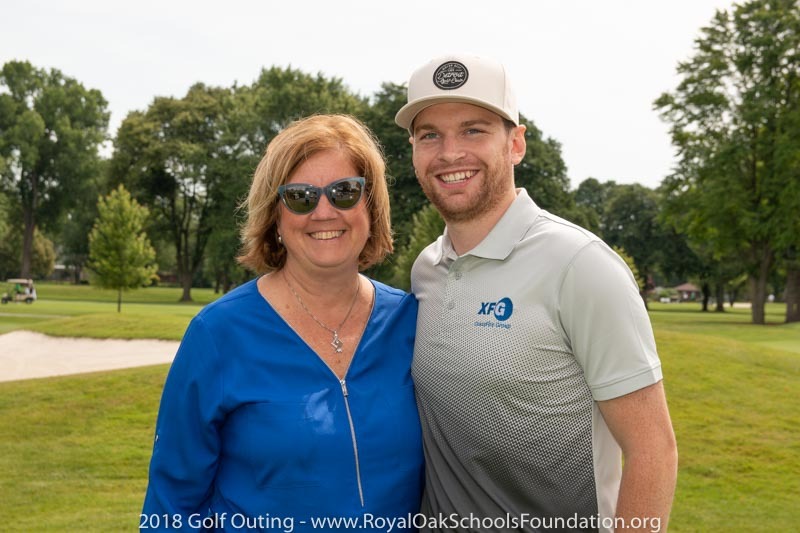 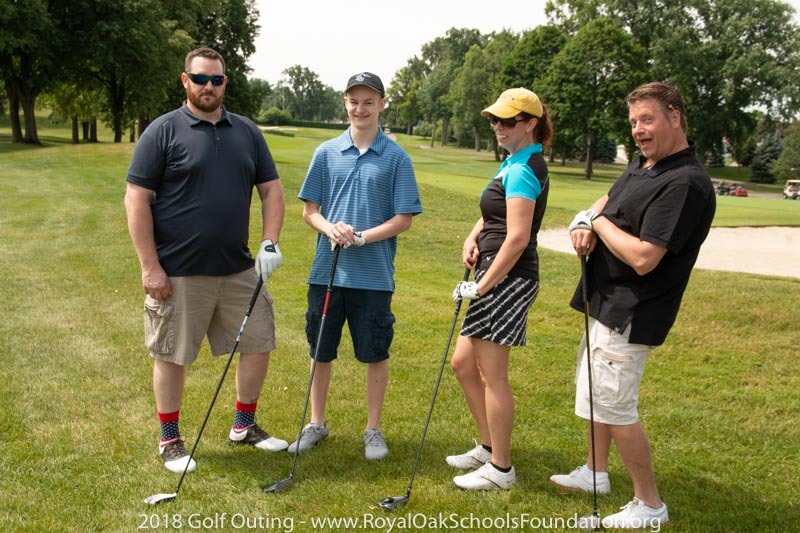 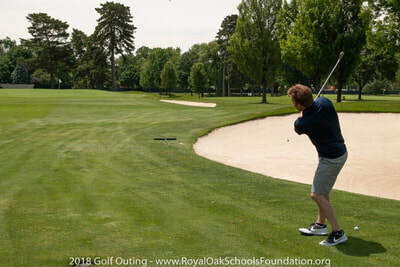 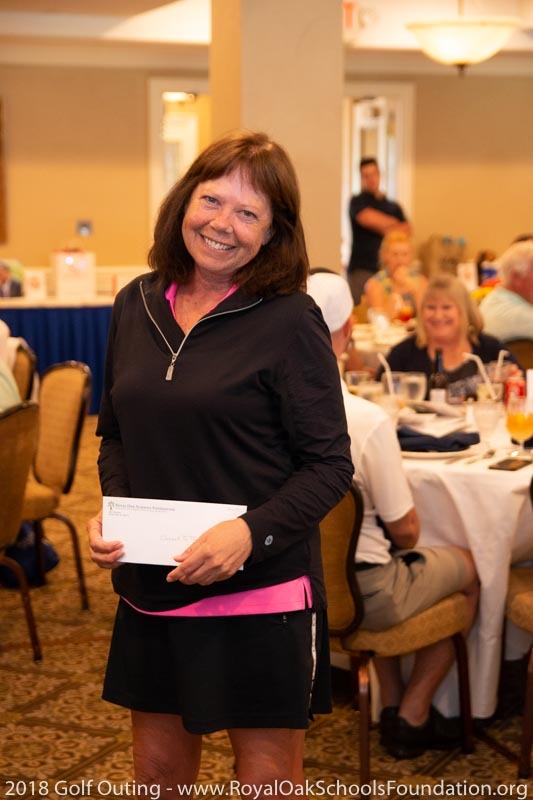 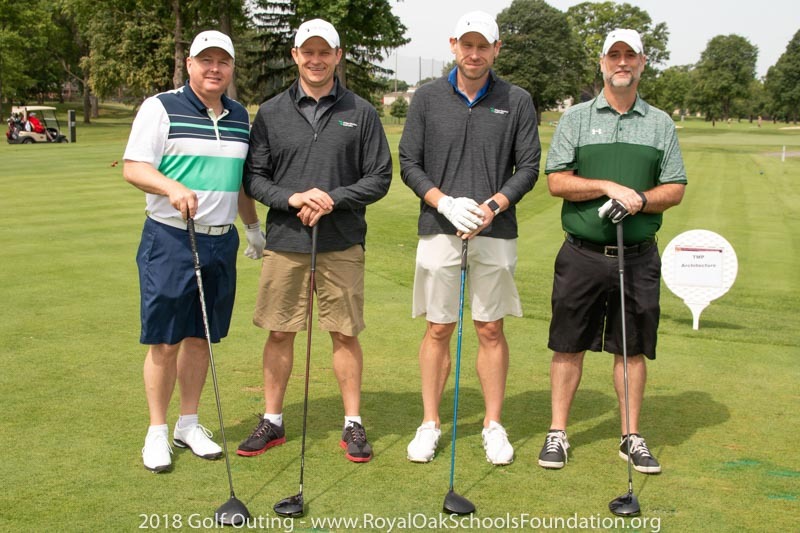 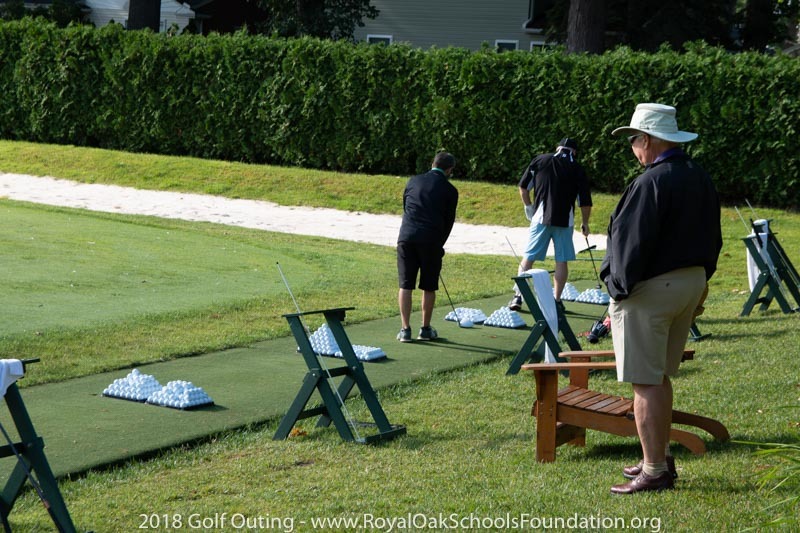 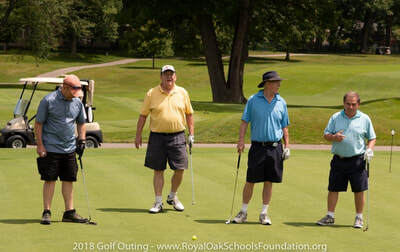 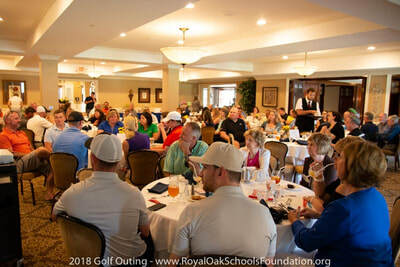 While there were plenty of winners, the real winners were the students and faculty of Royal Oak Schools who will benefit from the generosity of our golfers, sponsors and donors for years to come. 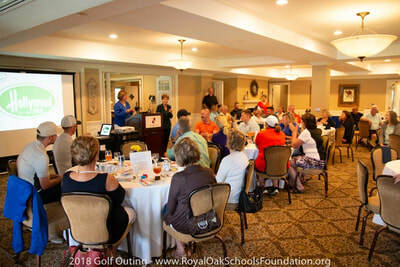 A hearty Thank You goes out to all who attended. 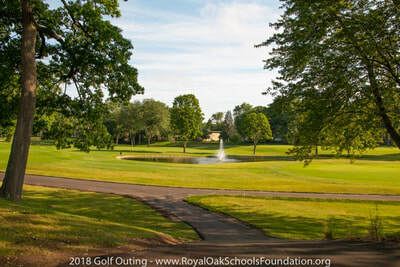 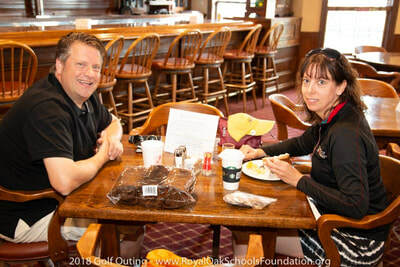 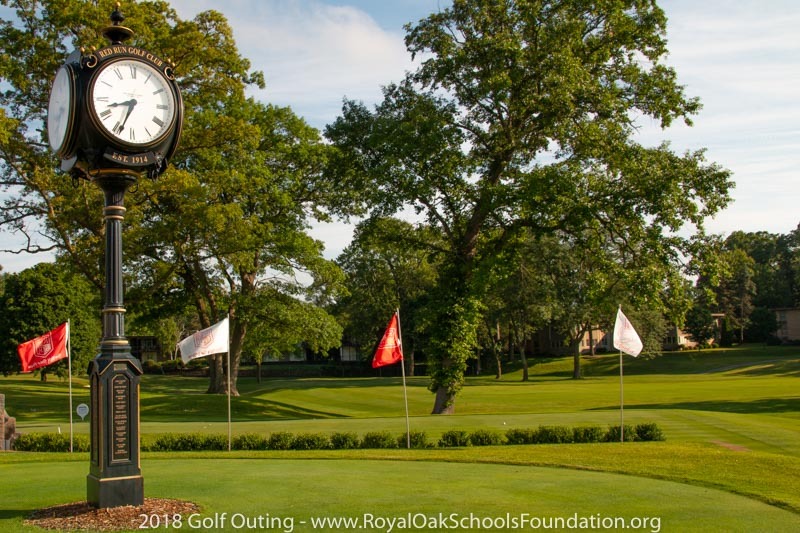 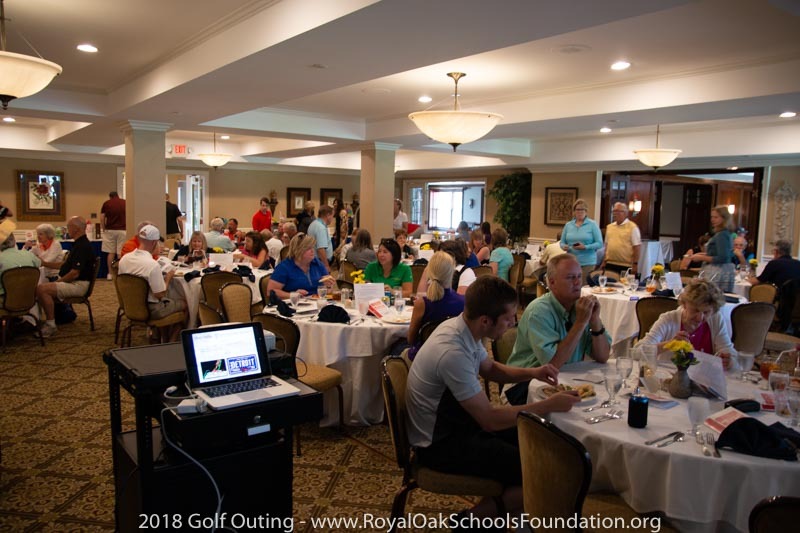 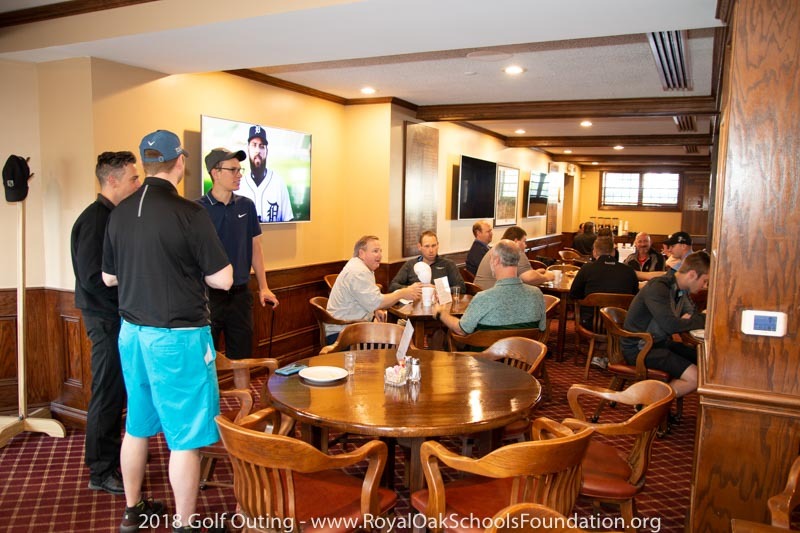 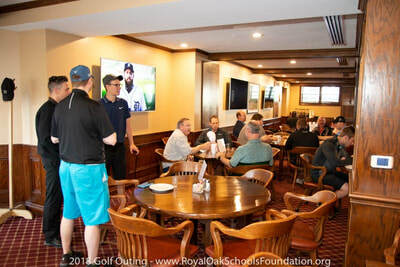 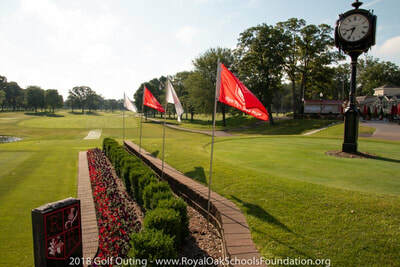 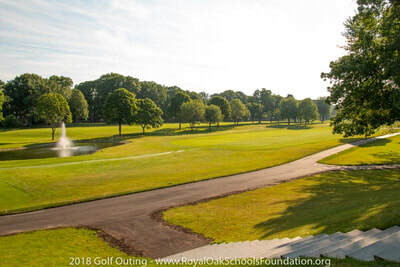 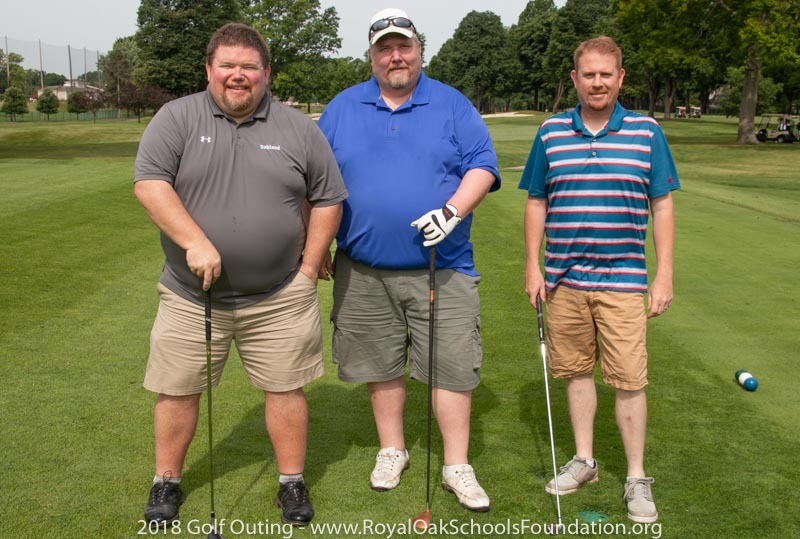 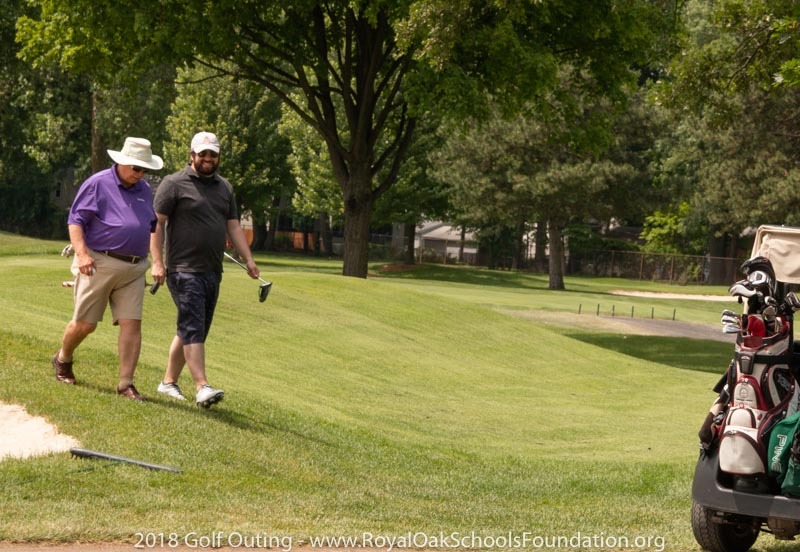 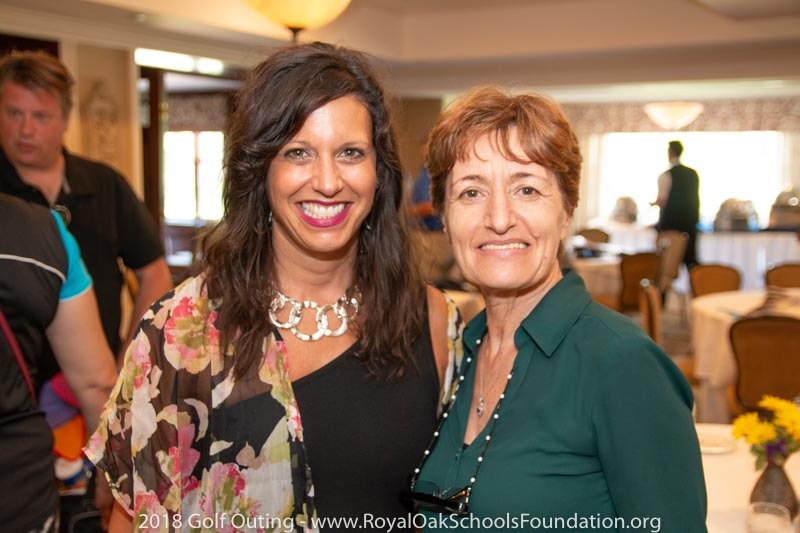 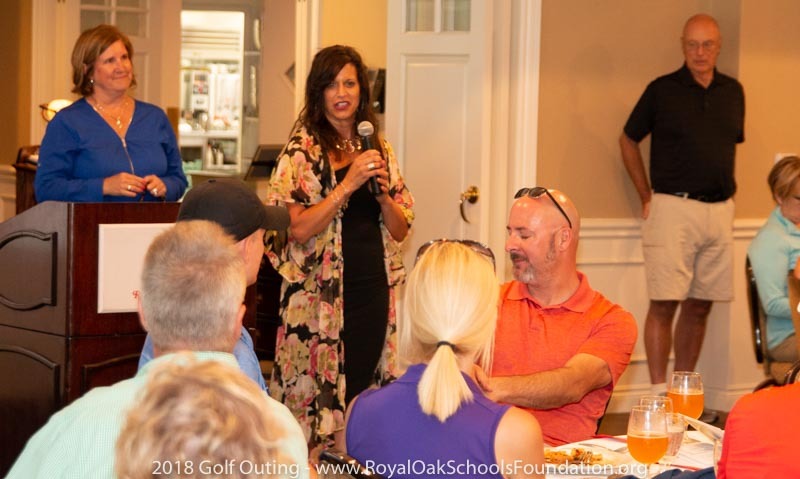 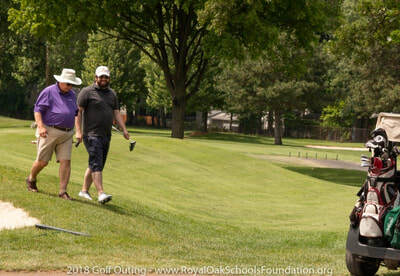 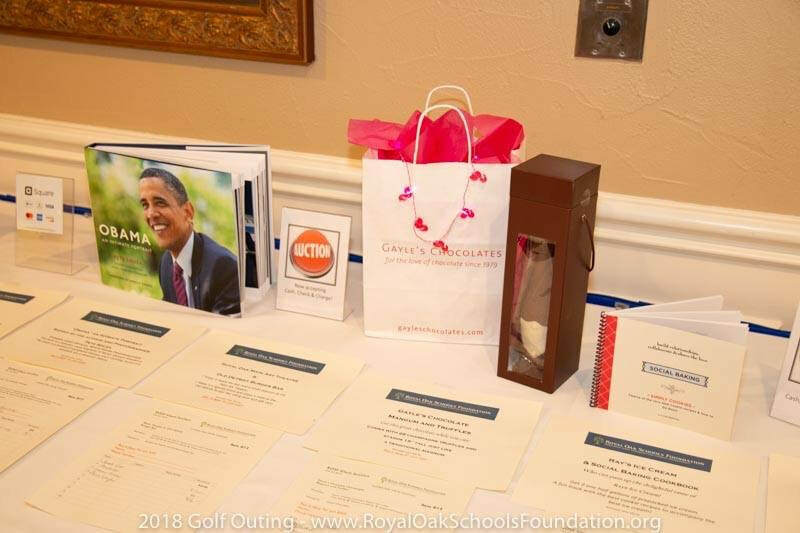 Please tell everyone to join us next year, either as a golfer or a sponsor so we can raise even more money for the Royal Oak Schools Foundation in 2019.